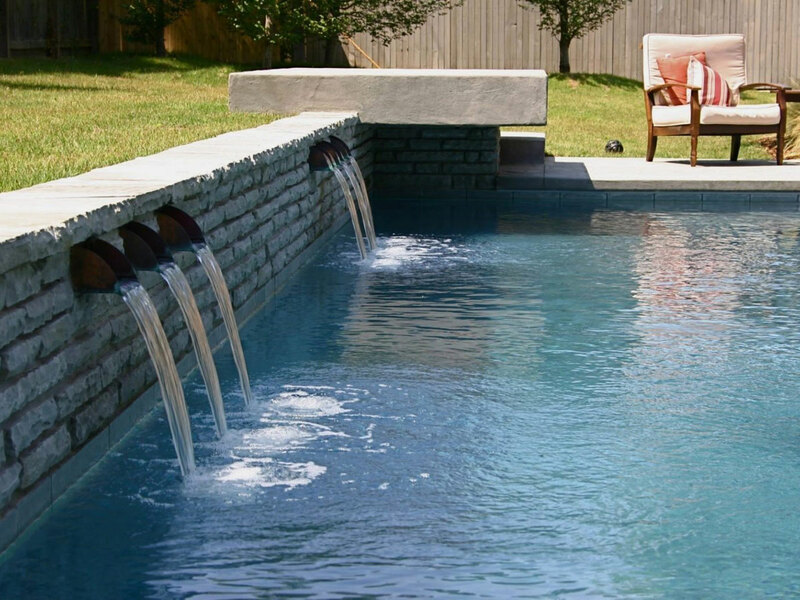 Contemporary… Free-form… Diver? 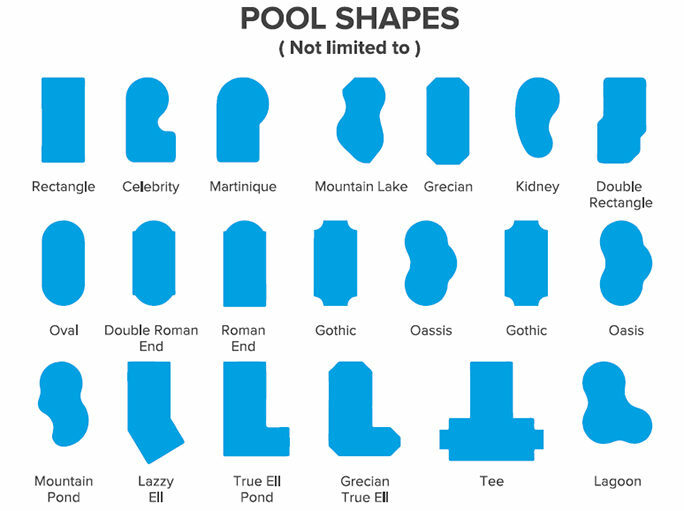 What does it all mean? 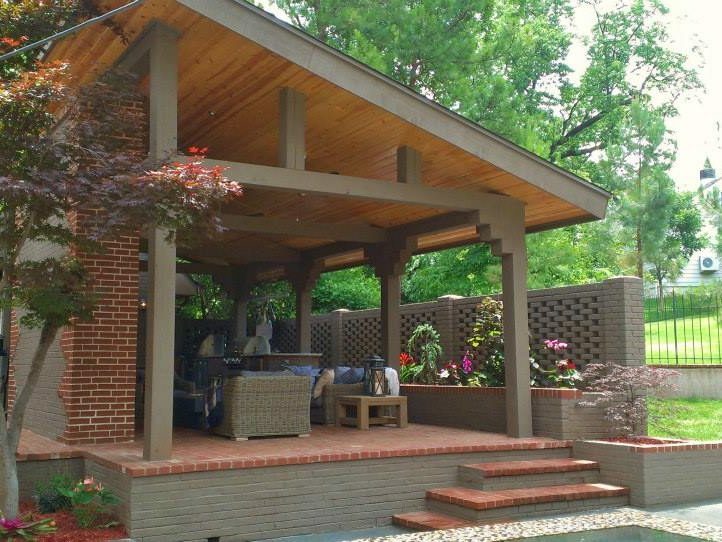 Let us help you get started with the basic layout and style that is right for you. 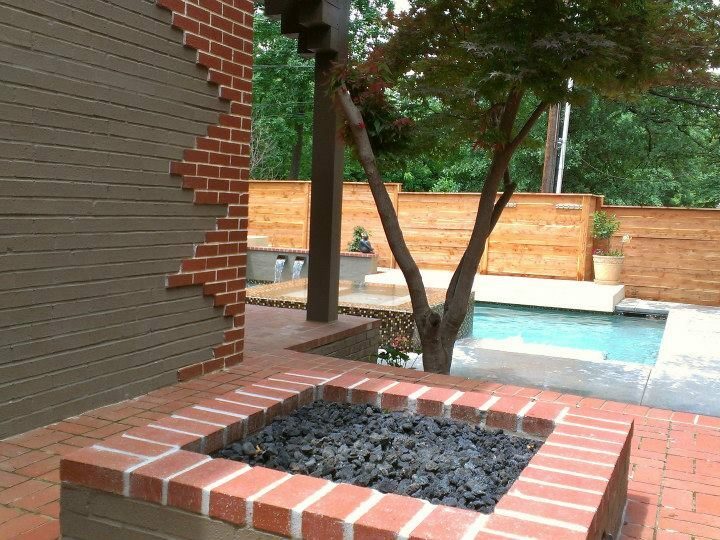 In addition to standard white or grey plaster, we are proud to offer a wide range of color and texture options to suit your unique style. 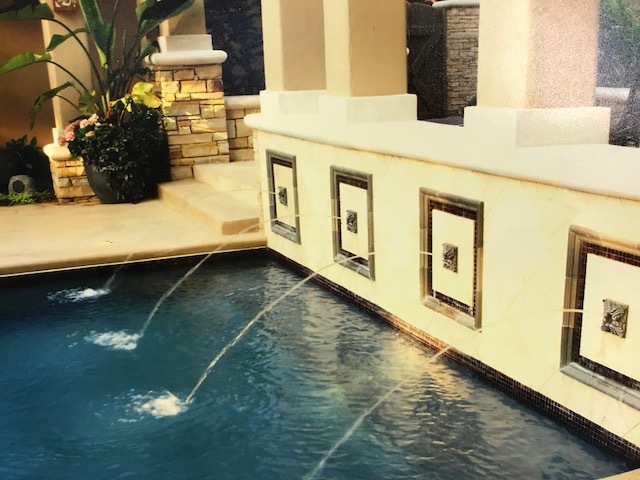 Browse through some of our most popular finishes, and visit Pebbletec.com to see our full line of Pebble Fina, Tec, Sheen, and Brilliance options from PebbleTec. 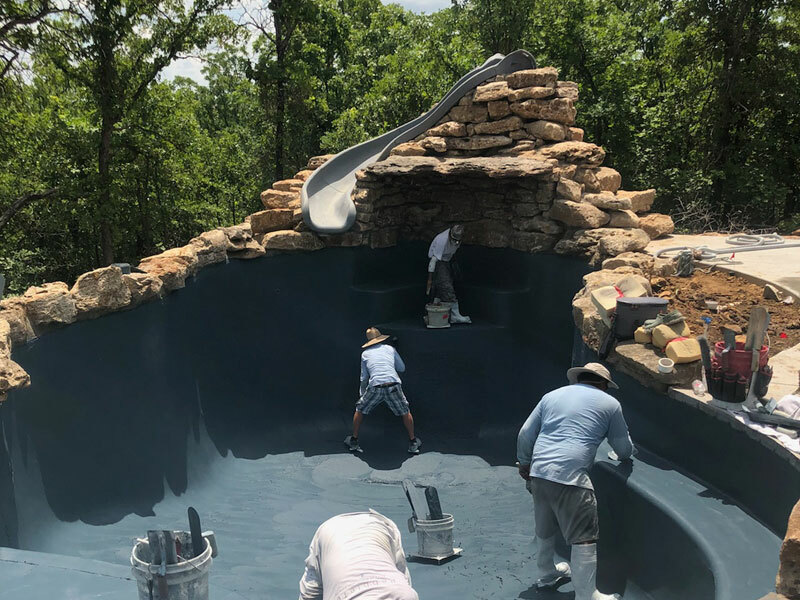 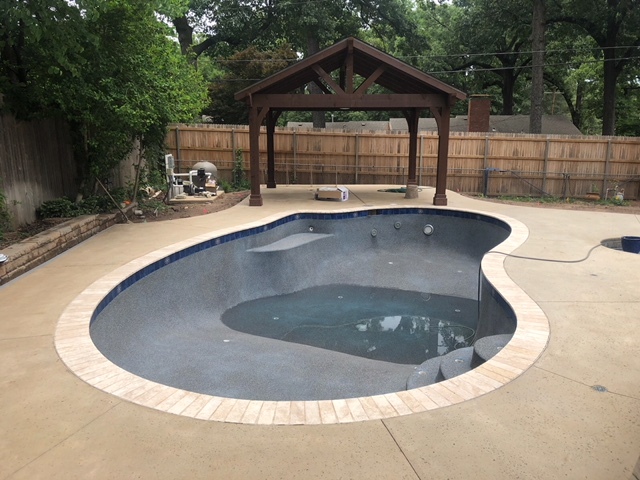 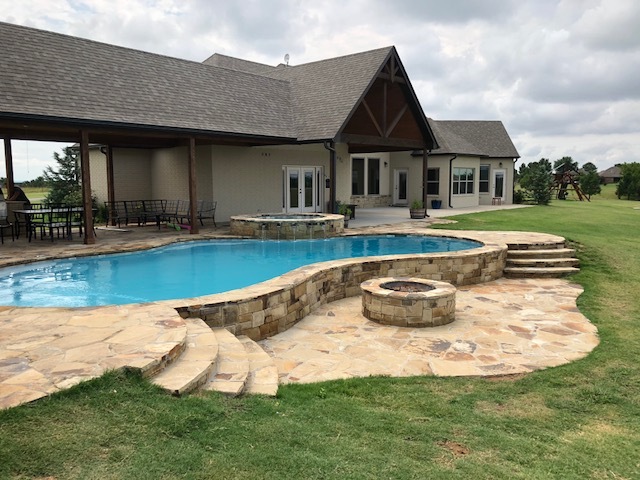 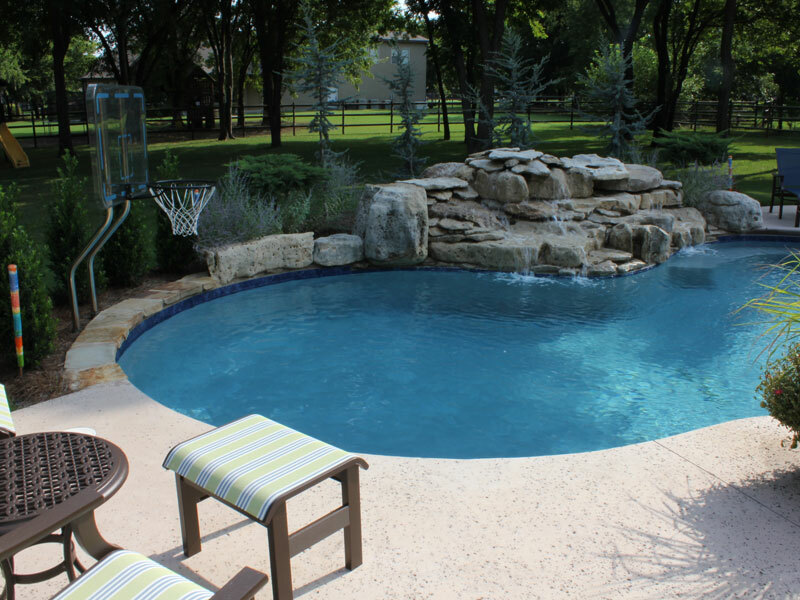 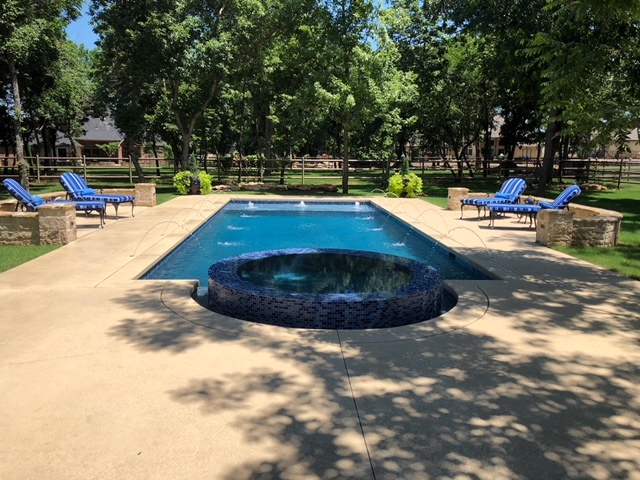 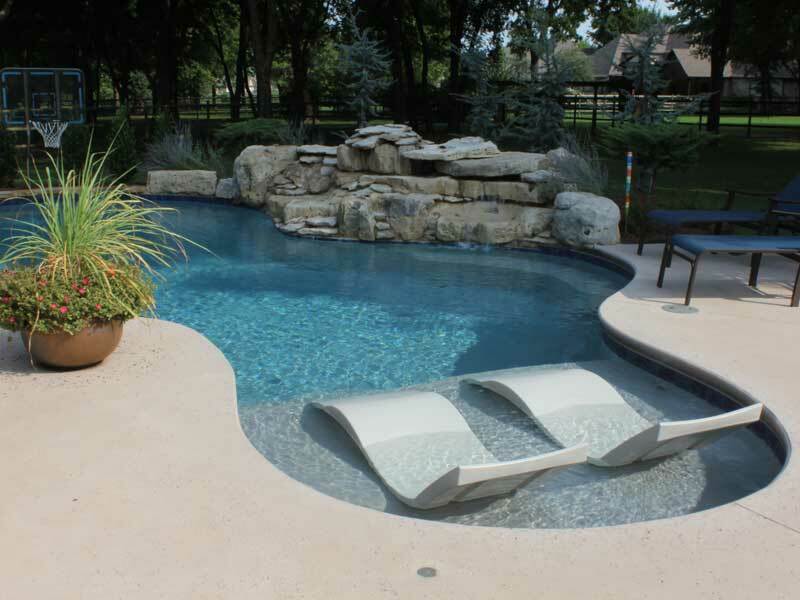 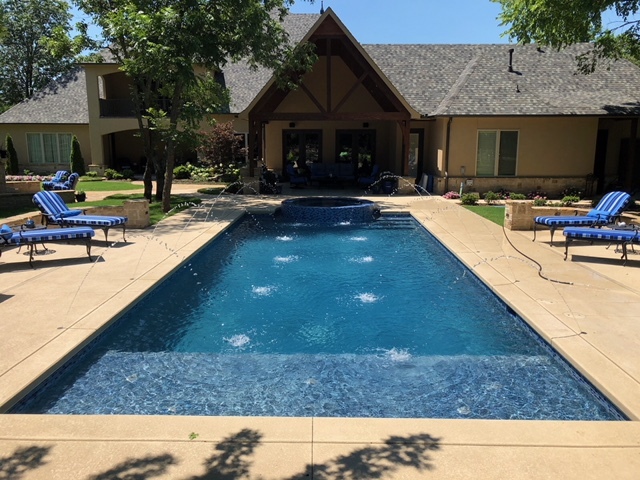 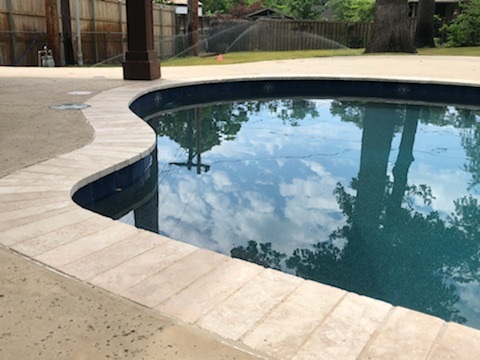 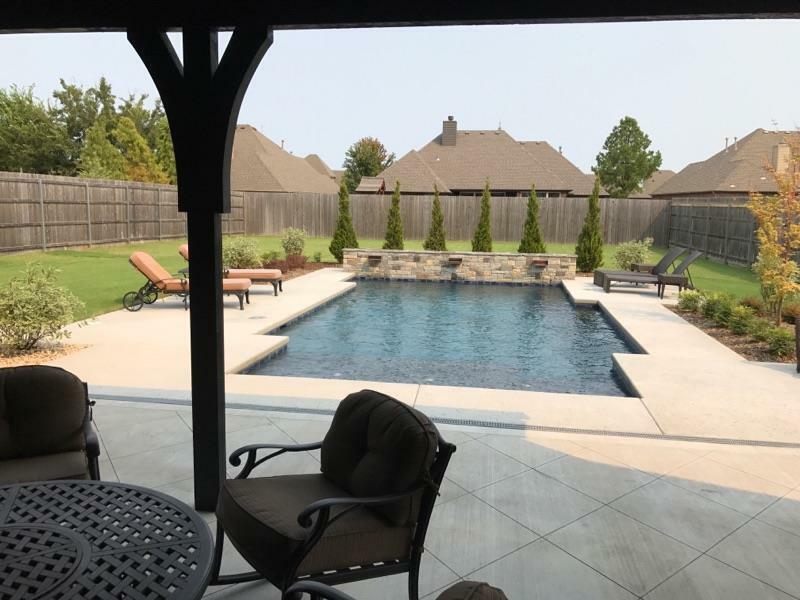 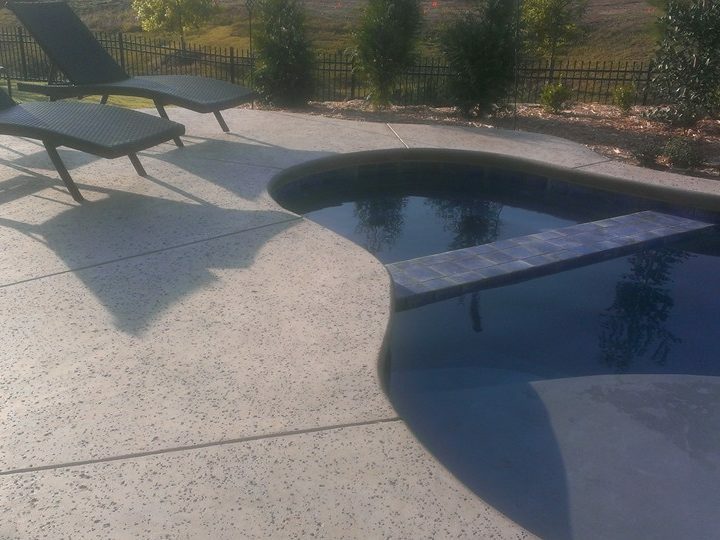 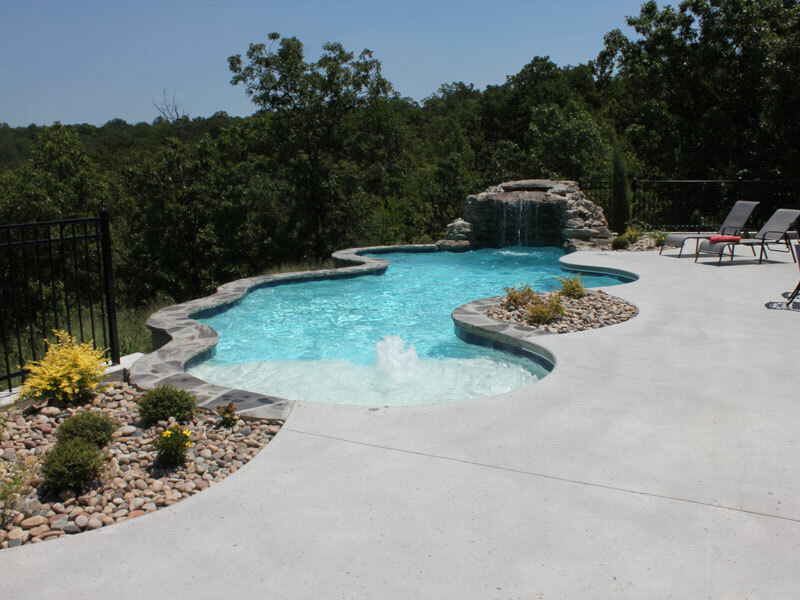 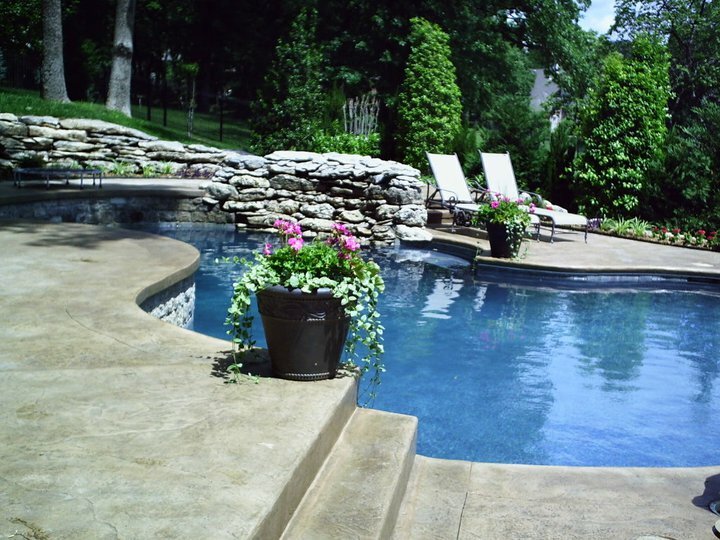 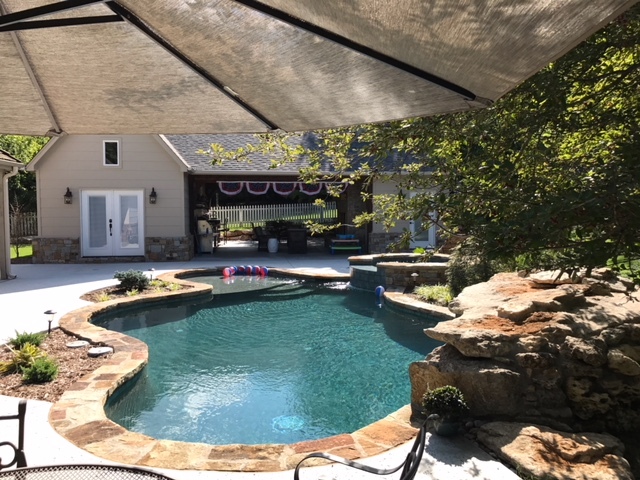 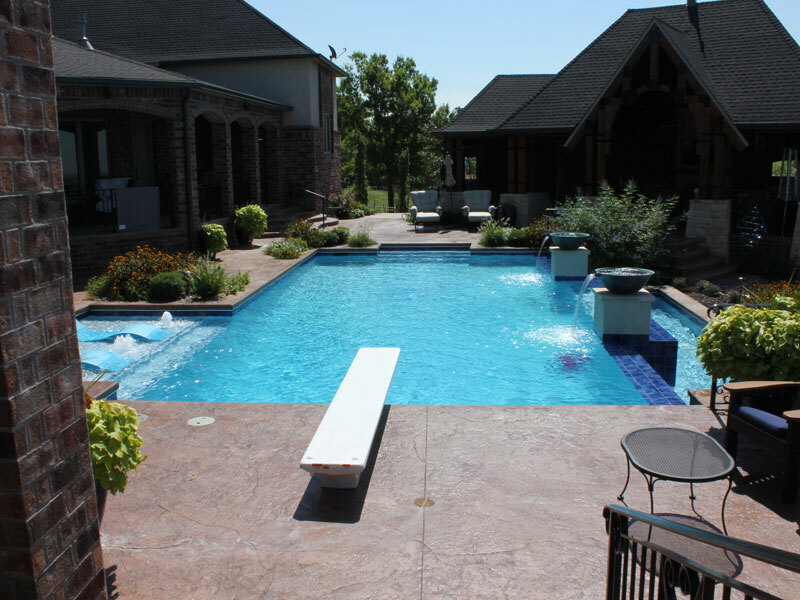 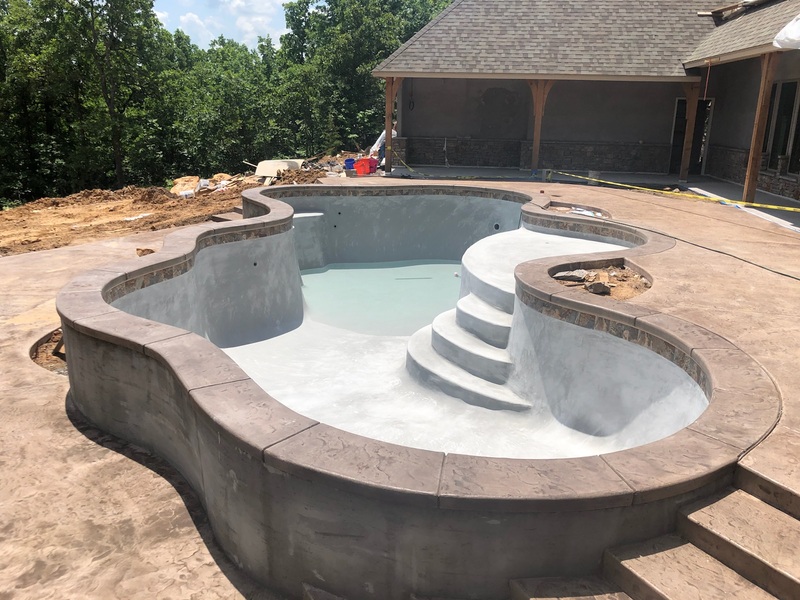 View more Pool Finish Options on our Facebook page. 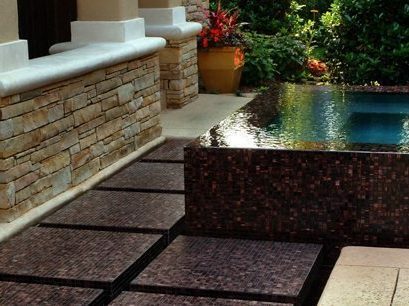 Choose from right here in our show-room, or venture out to visit with our local partners in tile sales. 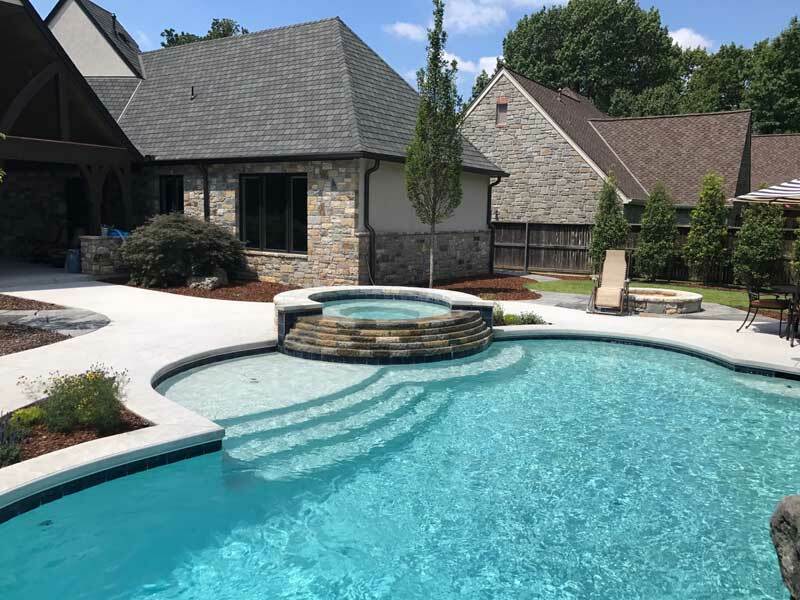 The possibilities in color, sizing, and layout are endless – but we are here to help you narrow it down and find exactly what you are looking for. 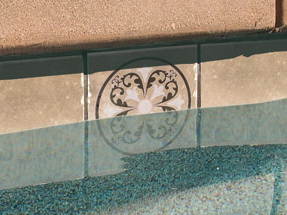 Explore more Tile Design on our Facebook here. 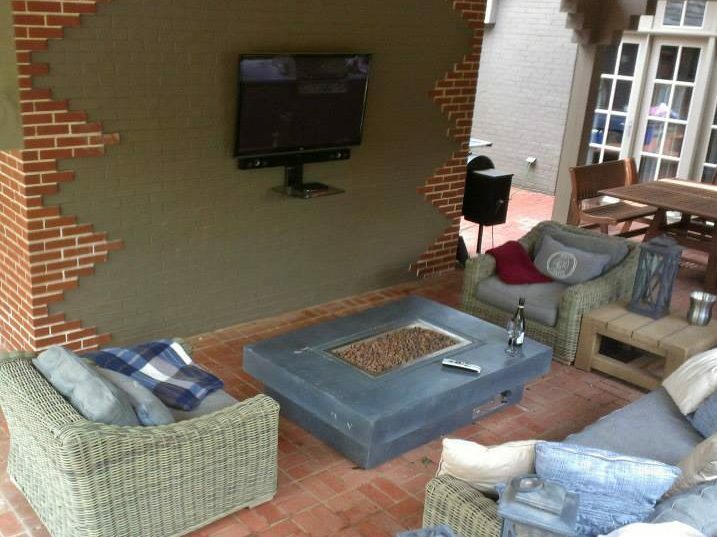 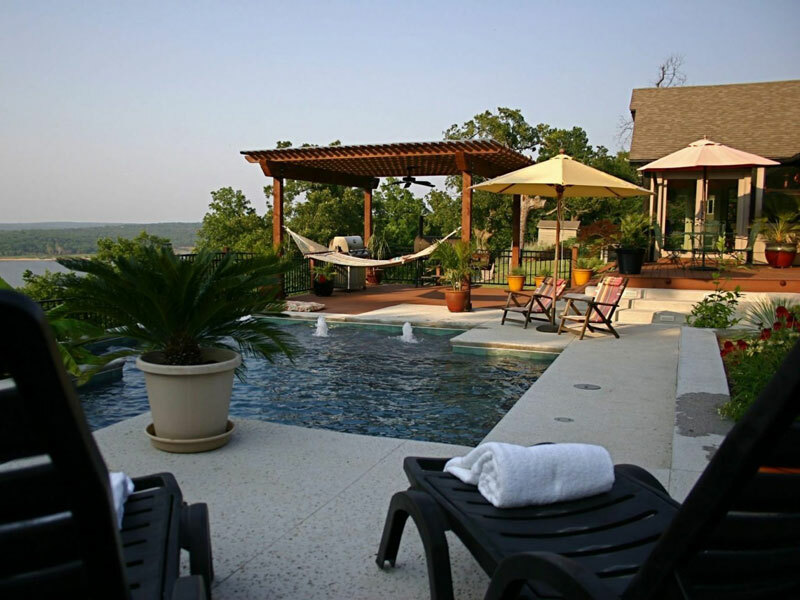 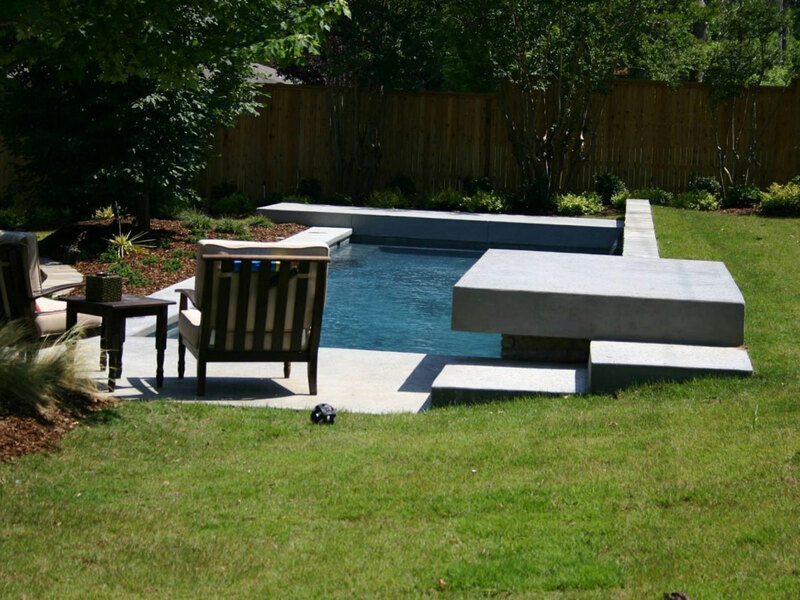 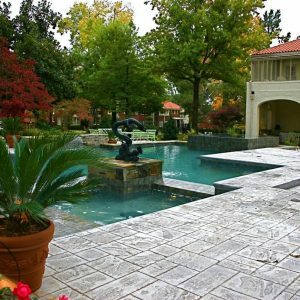 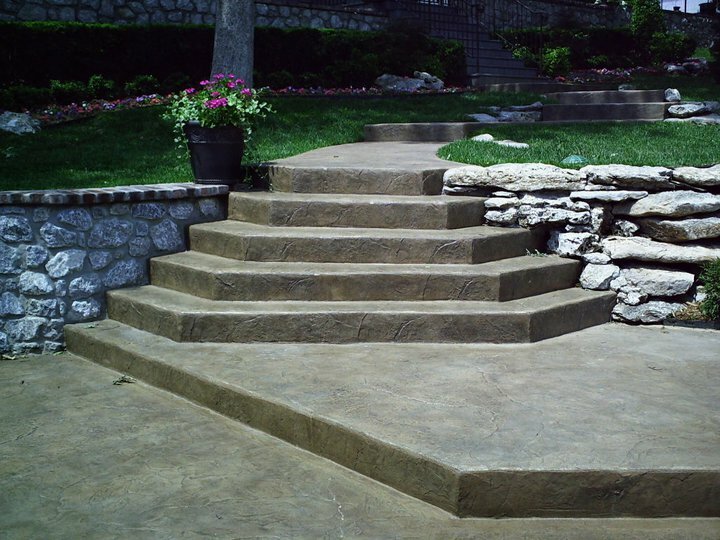 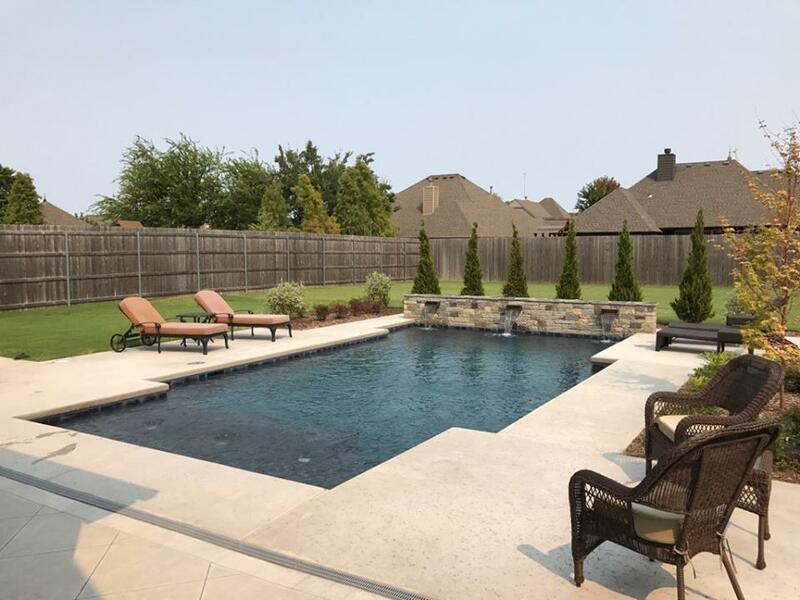 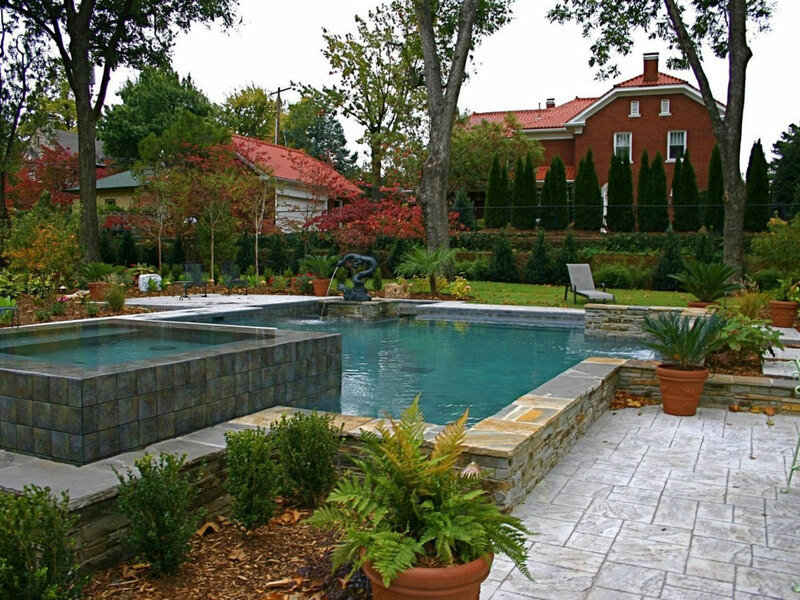 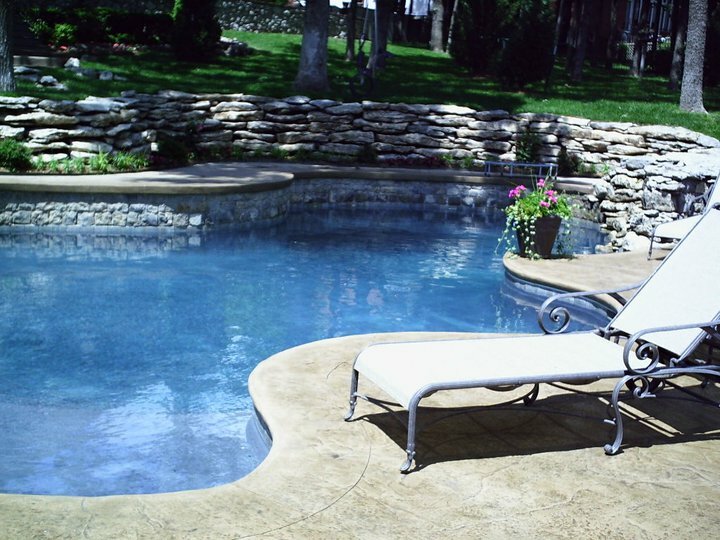 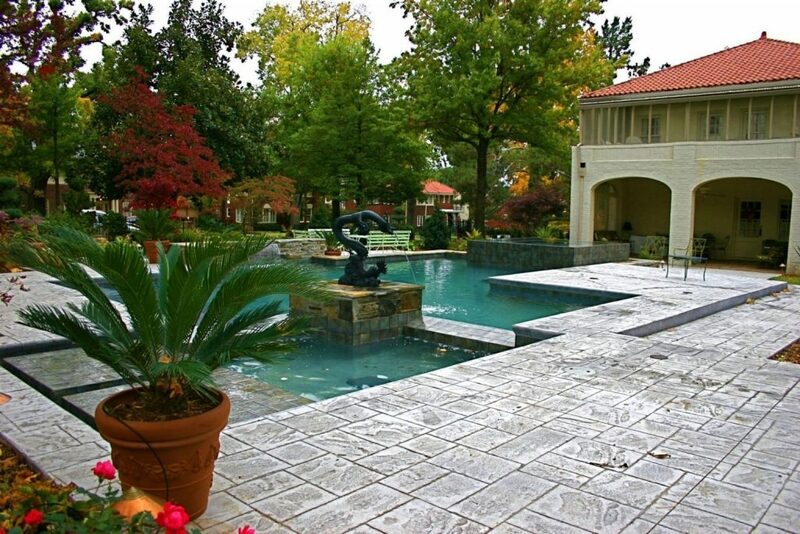 Top off your project with hand-crafted coping made of poured concrete, cut stone, travertine, or pre-cast pavers. 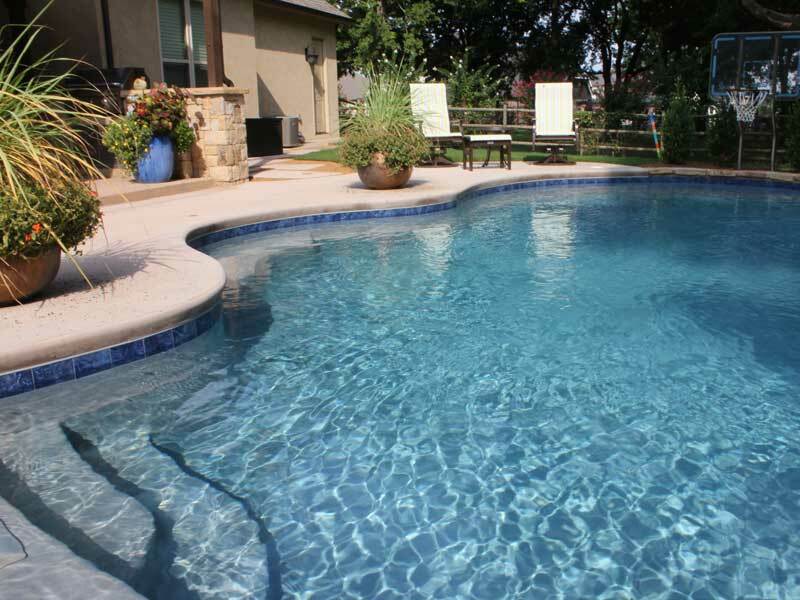 Click here to explore these options, and more. 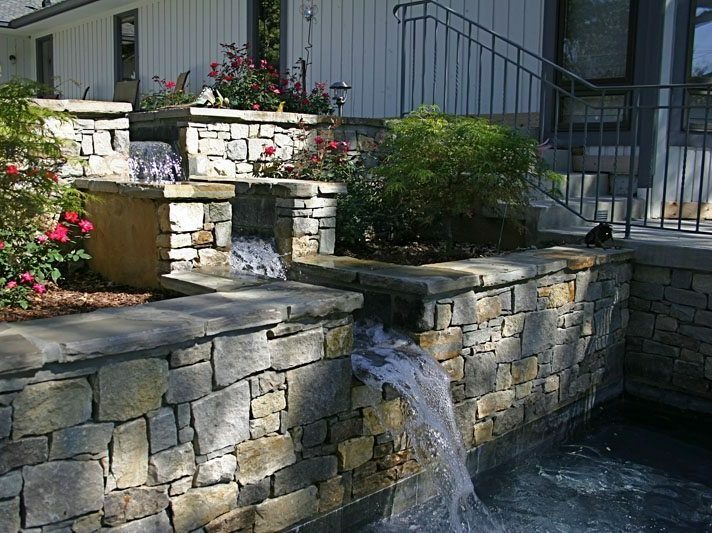 Check out additional Coping Styles on our Facebook page. 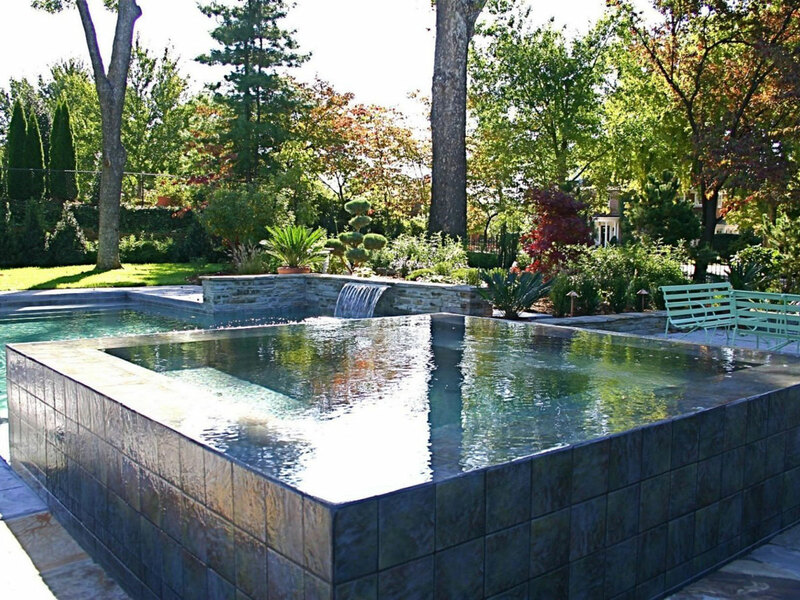 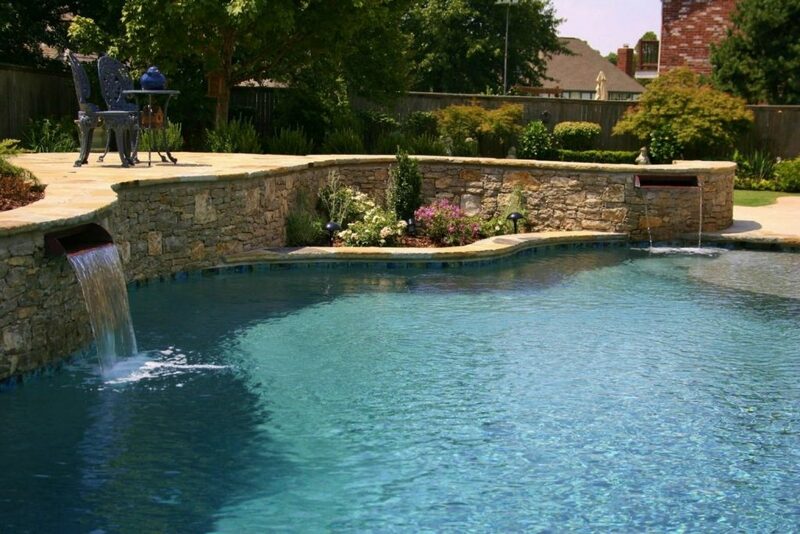 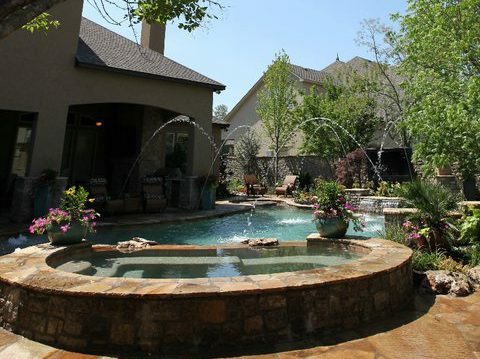 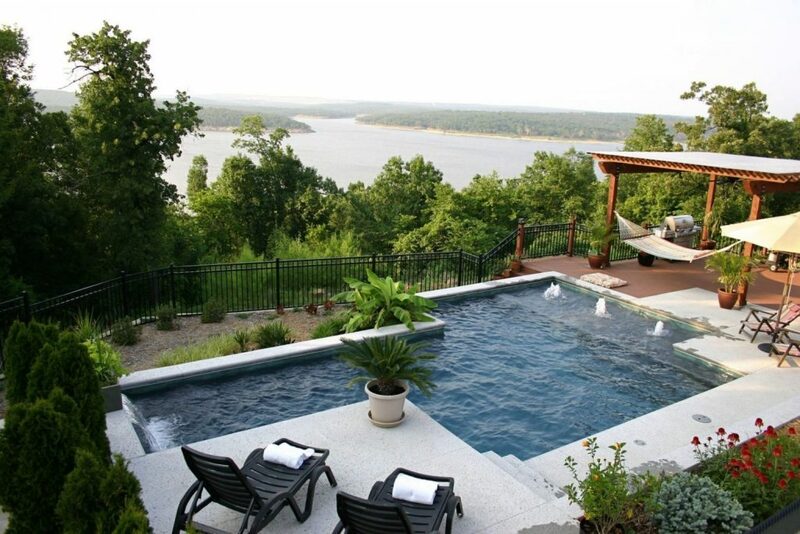 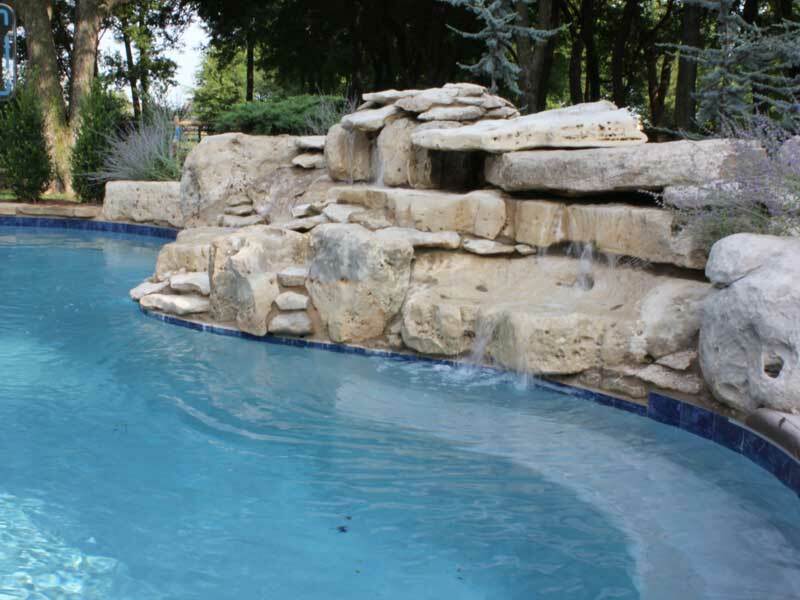 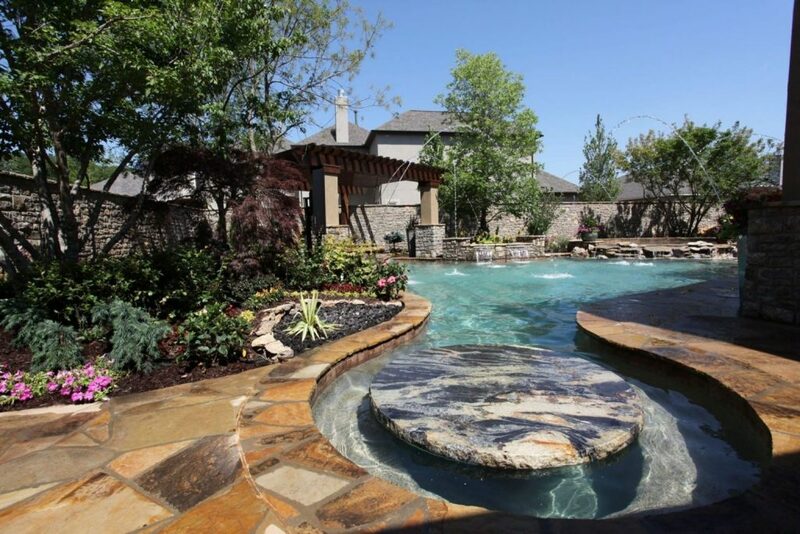 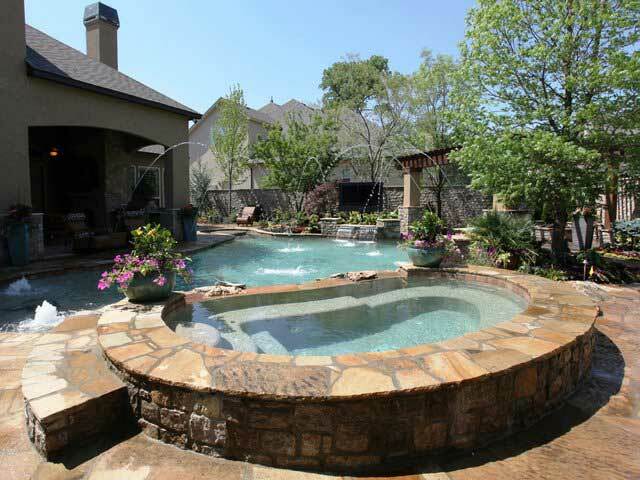 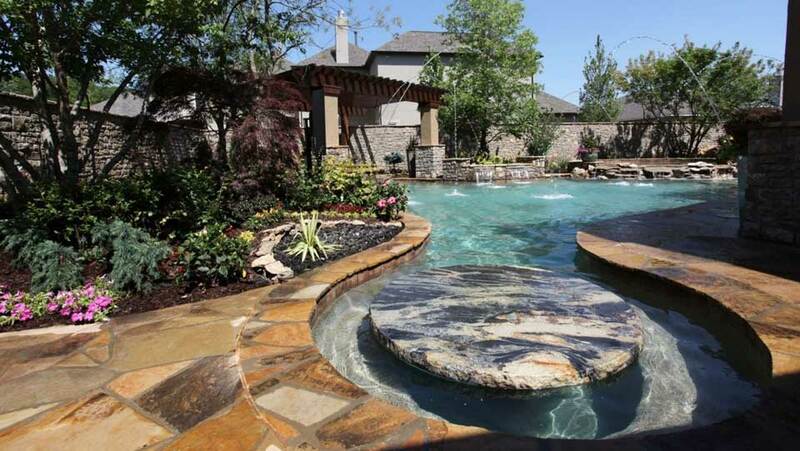 From cascading waterfalls to serene copper sheet-falls, water features are an elegant addition to any pool project. 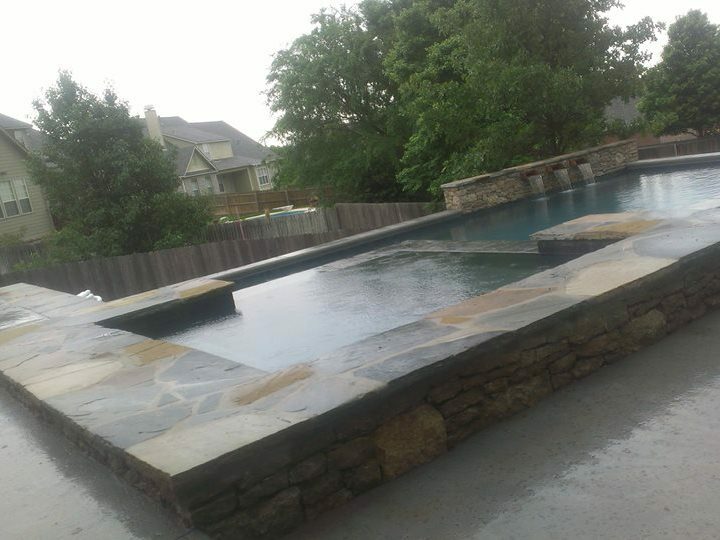 See more Water Features photos on Facebook. 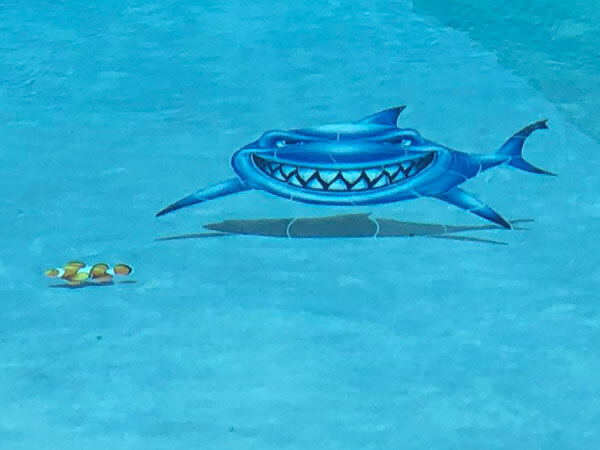 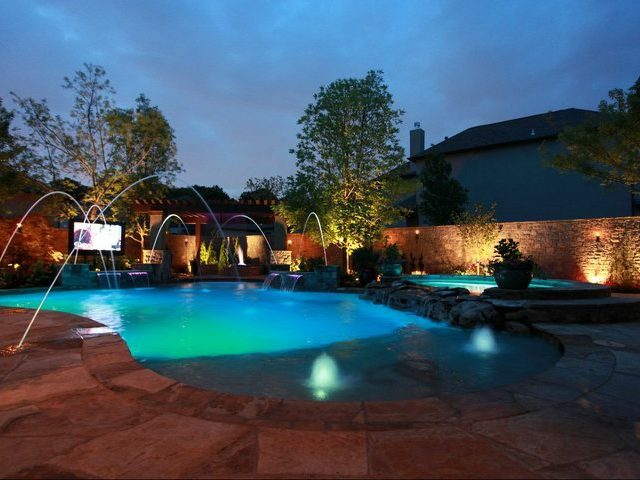 Our pool lights are more than just white. 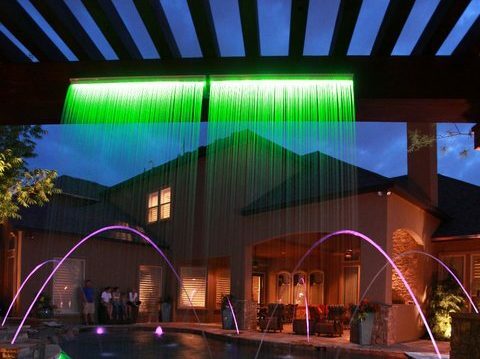 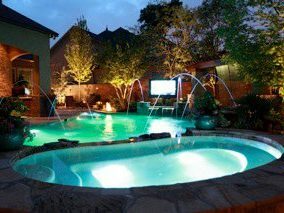 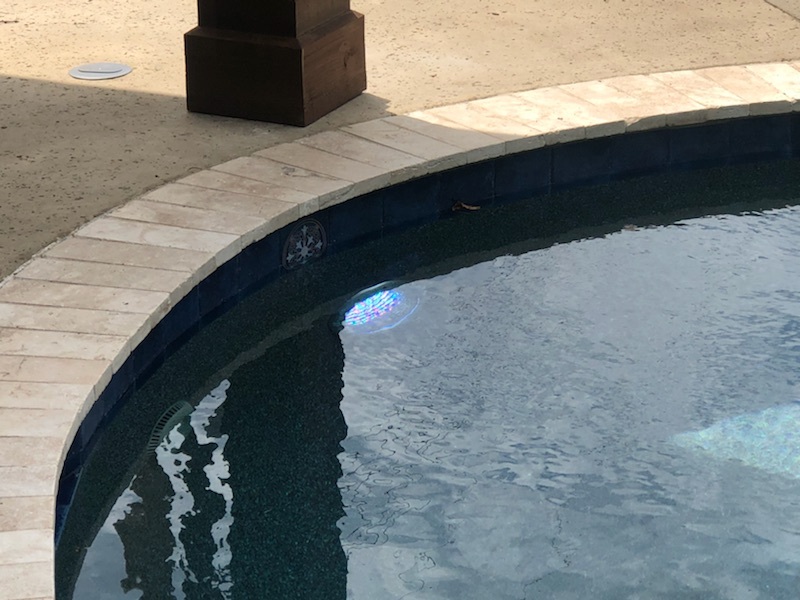 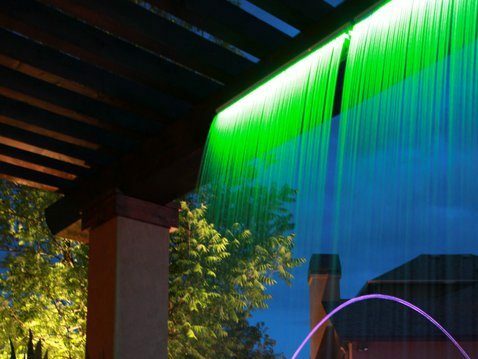 Pair your lighting with automation to illuminate your pool in an array of changing or constant colors to suit your mood. 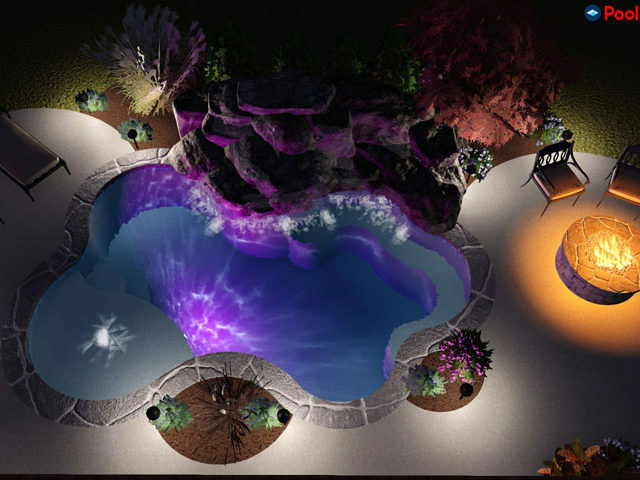 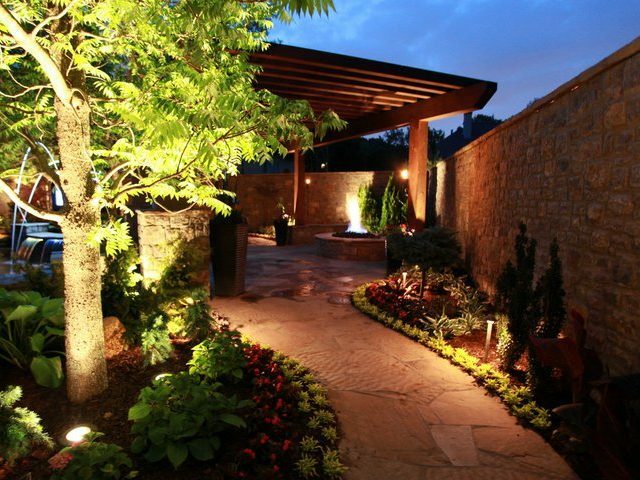 Get inspired with more Custom Lighting on our Facebook. 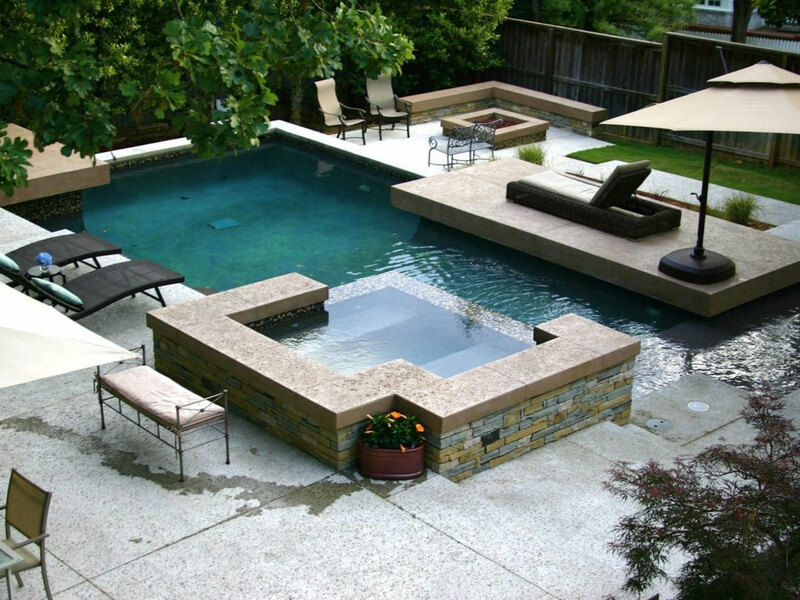 A pool bar offers a relaxing, convenient place to enjoy refreshments without ever leaving the water. 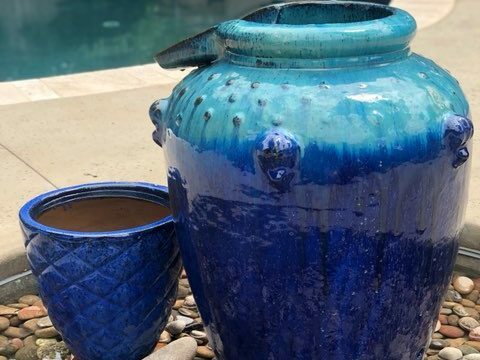 Discover the rewards of this “resort-style” accessory. 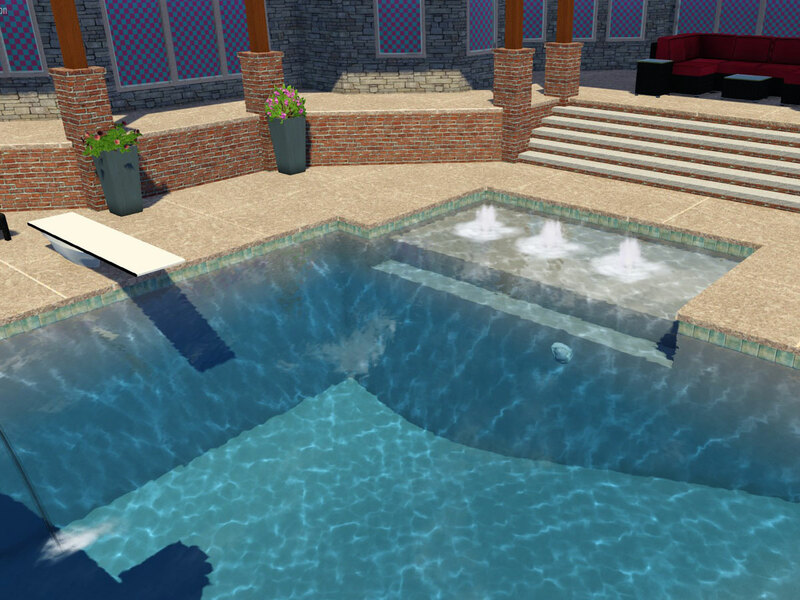 Explore more Pool Bars on our Facebook here. 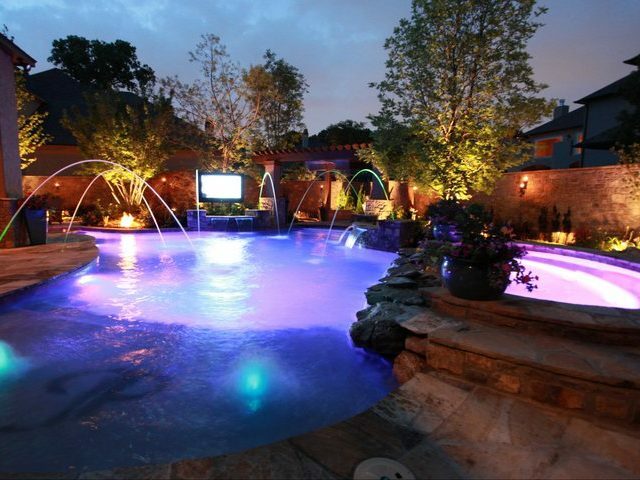 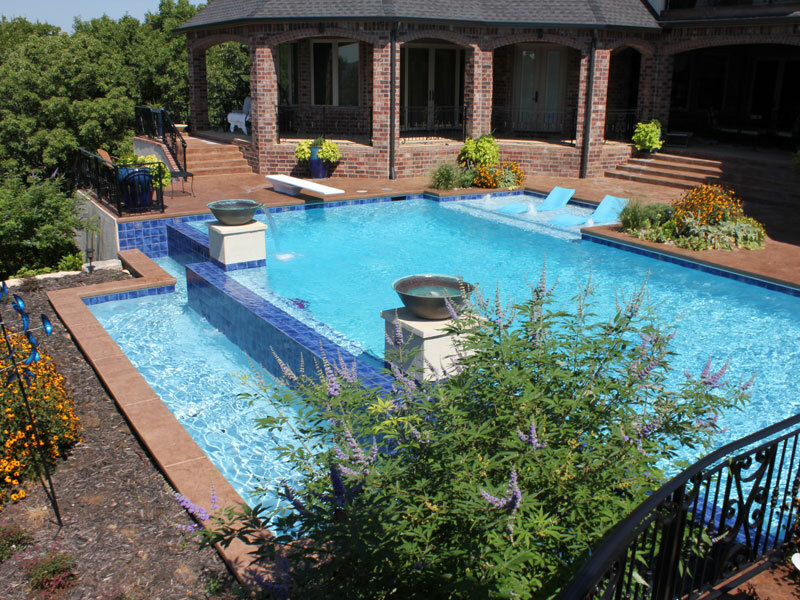 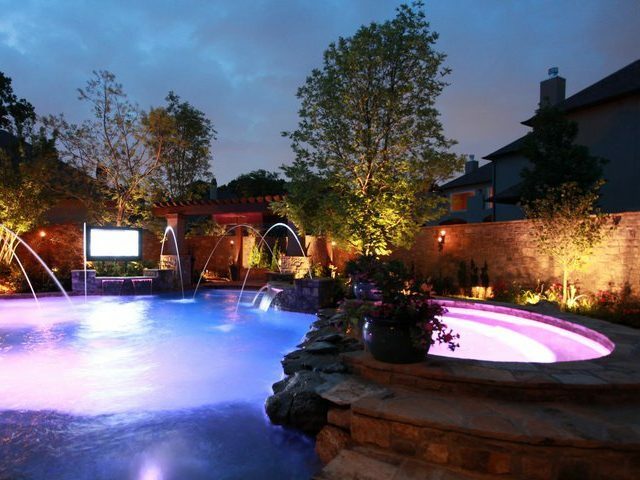 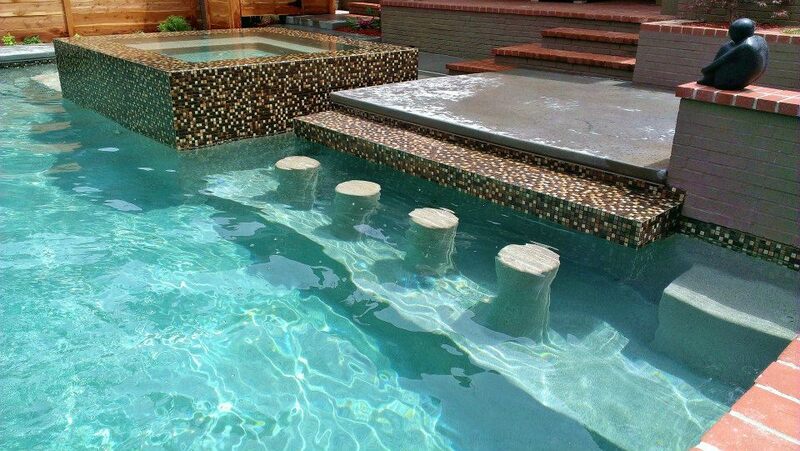 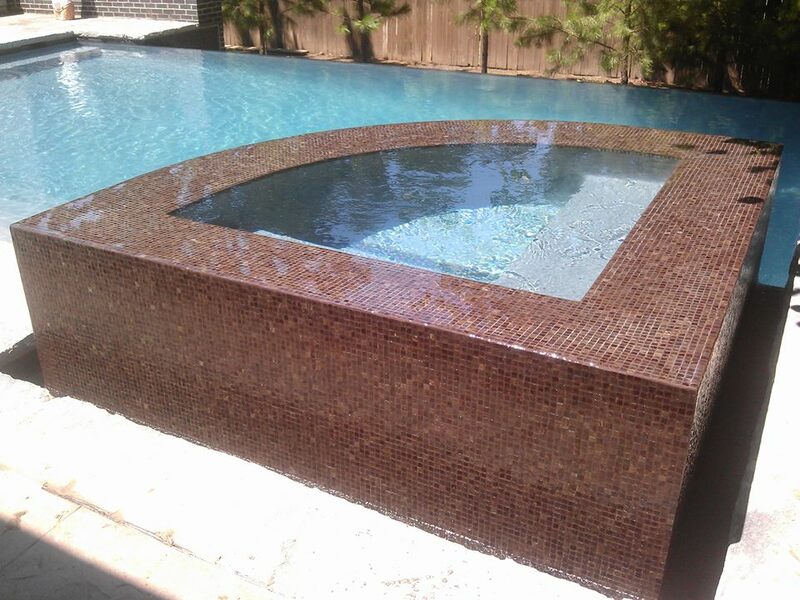 Looking to add the ultimate “wow” factor to your pool or spa? 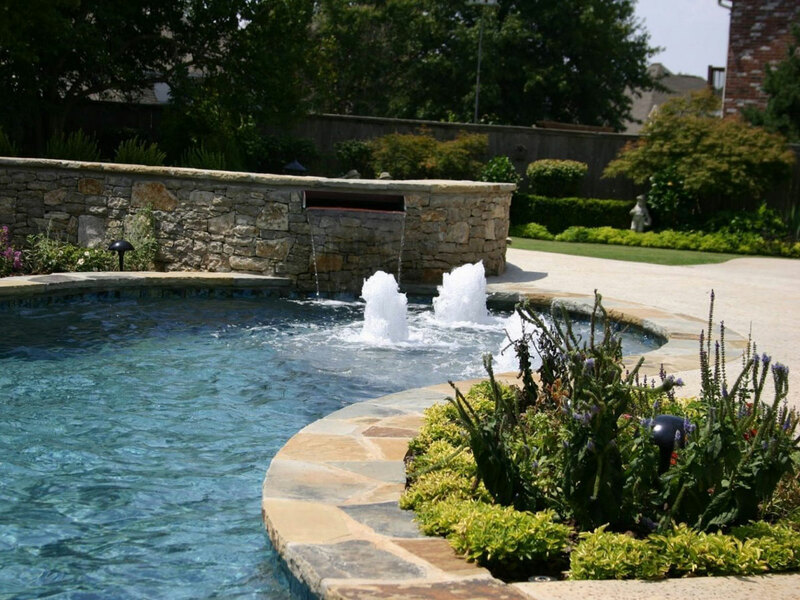 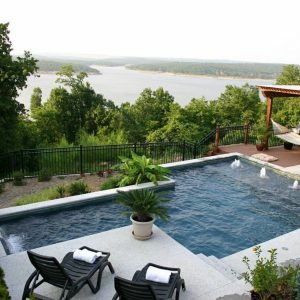 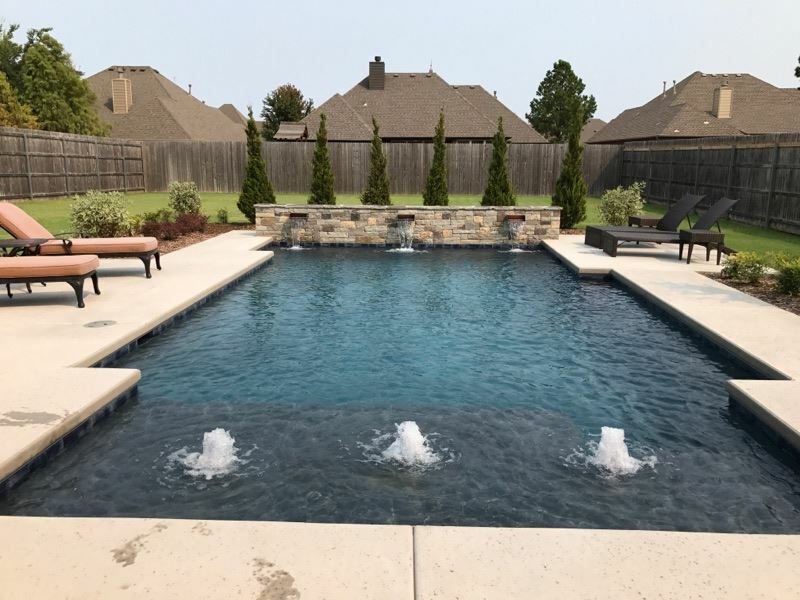 Take a look at some of our vanishing edge (or zero edge) and spa spillway projects. 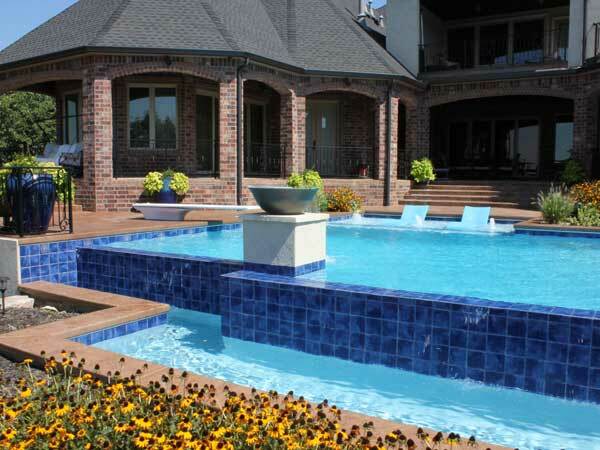 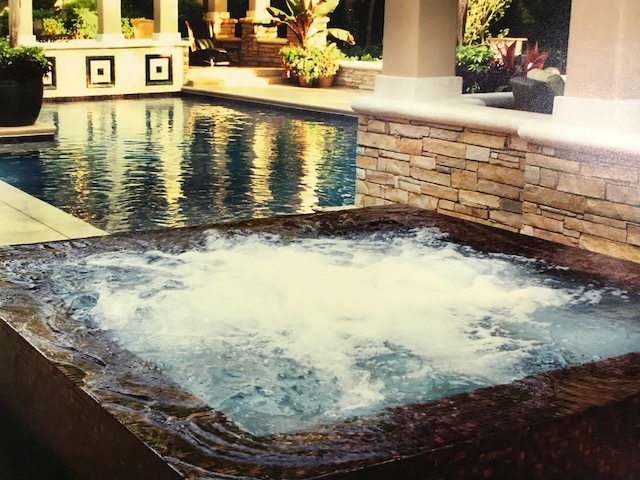 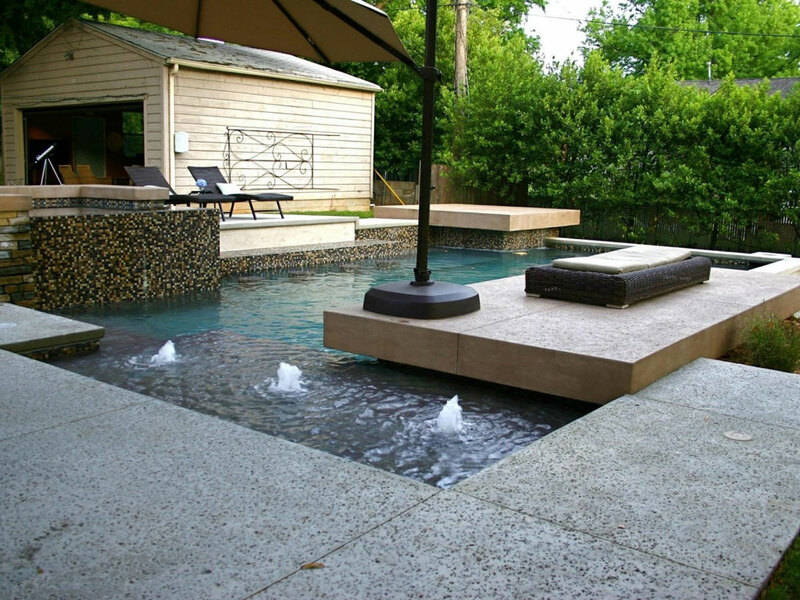 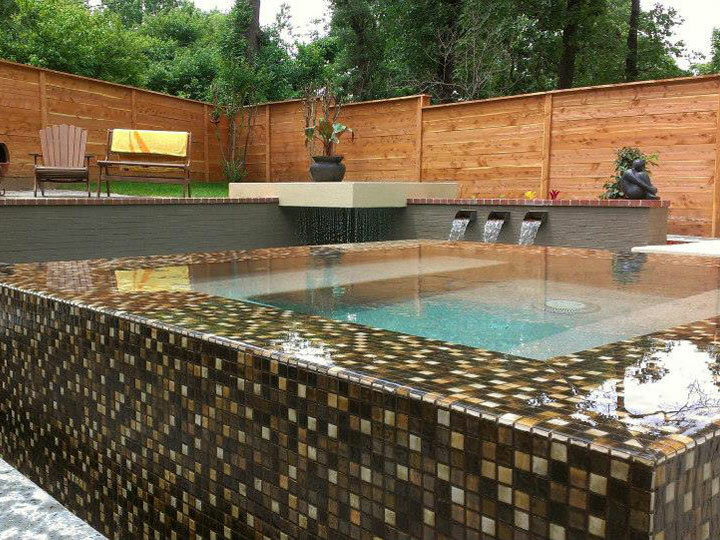 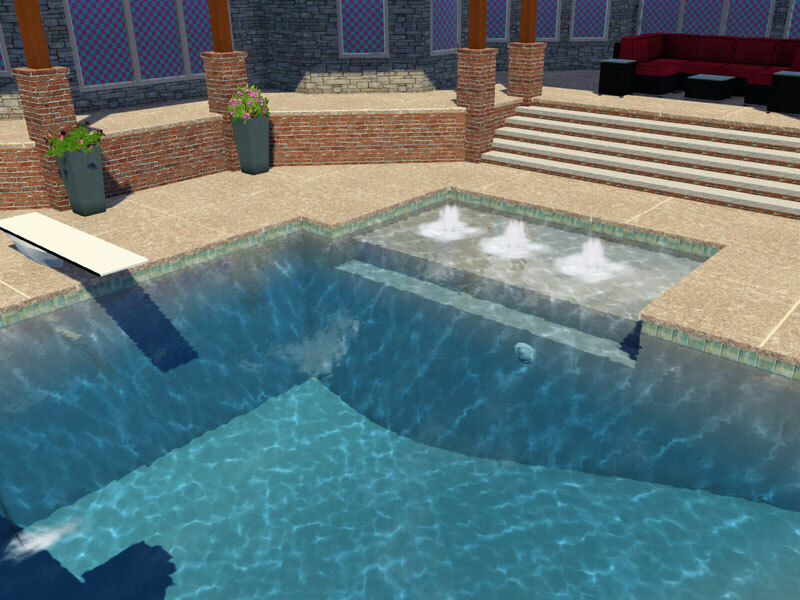 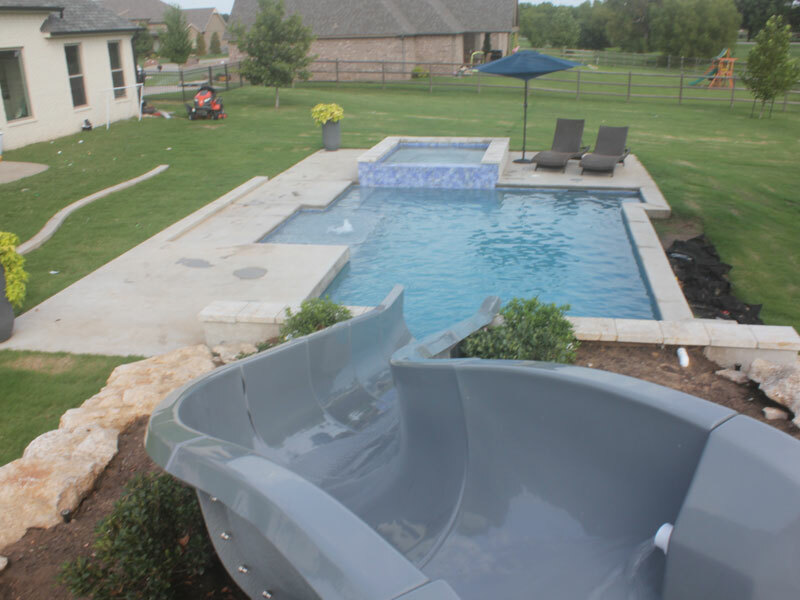 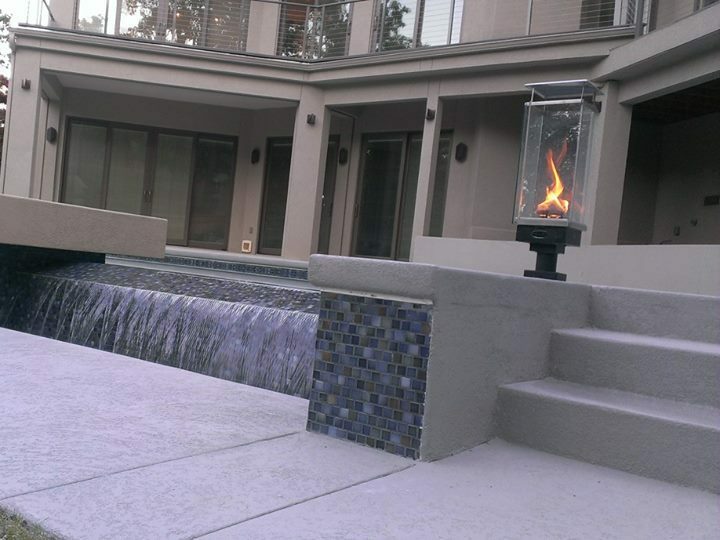 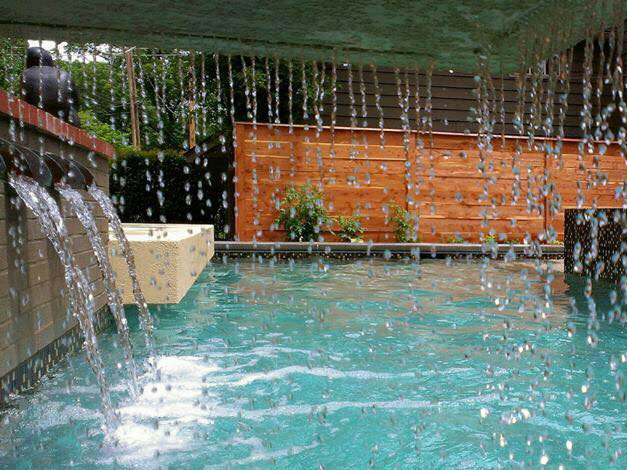 Find more Infinity Edge and Spa Spillways here. 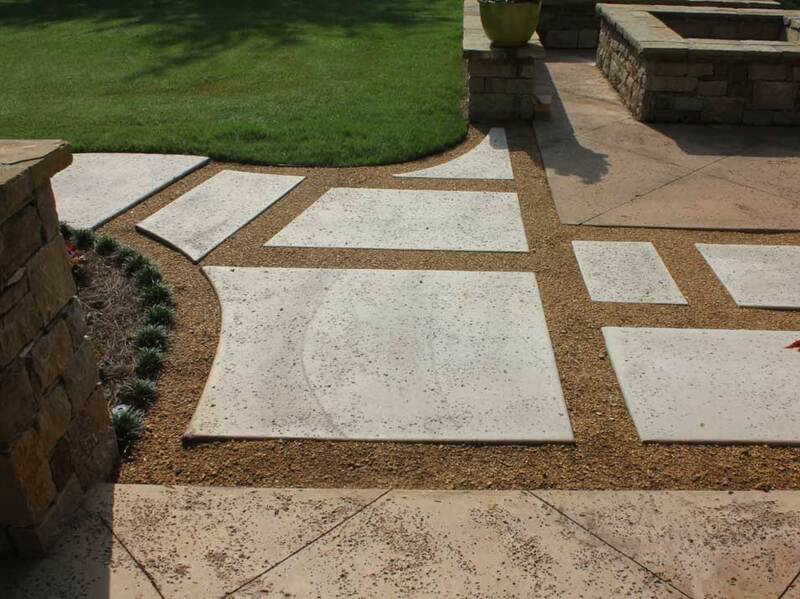 Set the tone of your back yard with gorgeous hardscaping, crafted by our expert crews. 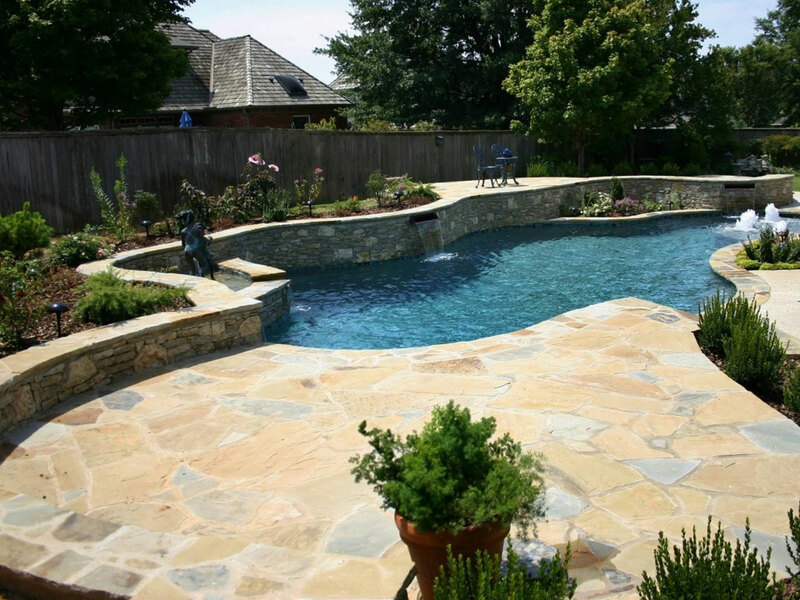 Options include flagstone, broom finish, salt finish, textured decking, stepping pads, pavers, and more. 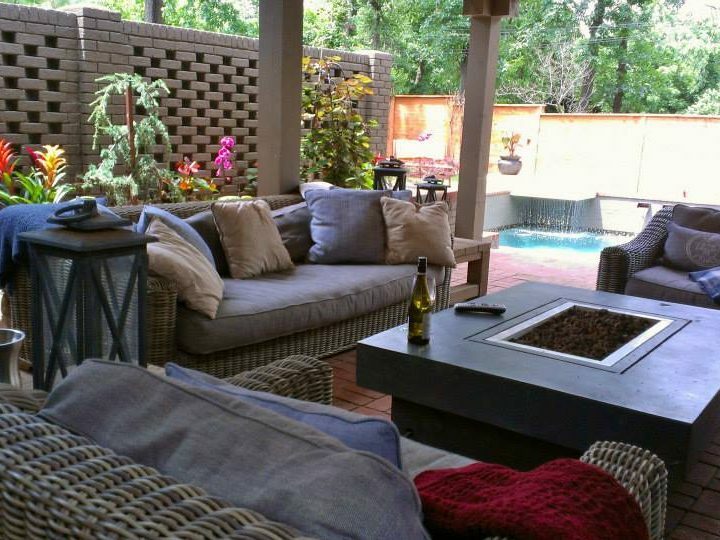 Enjoy more Decks, Paths, and Patios on our Facebook. 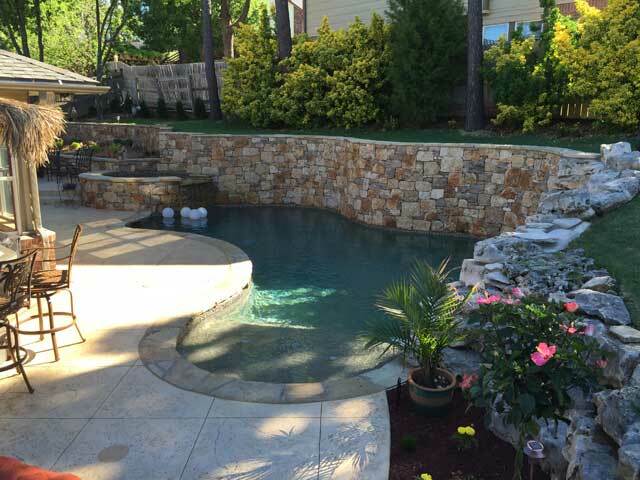 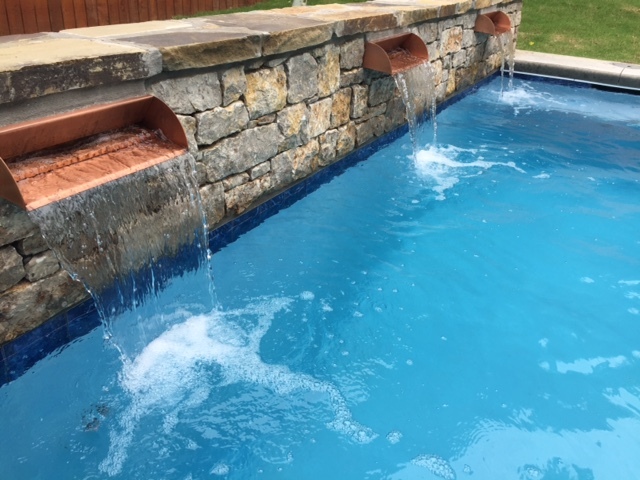 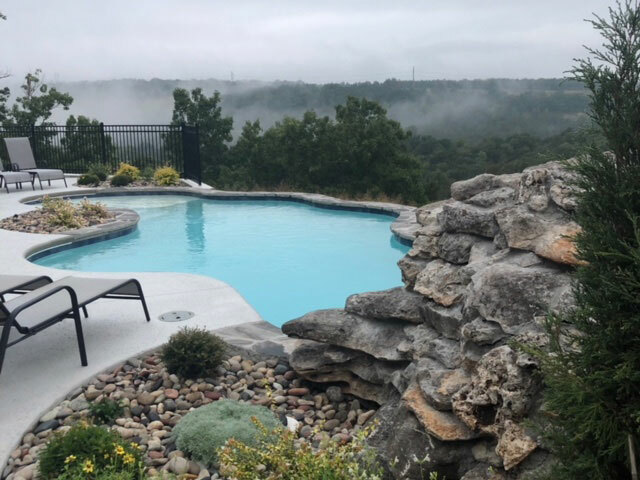 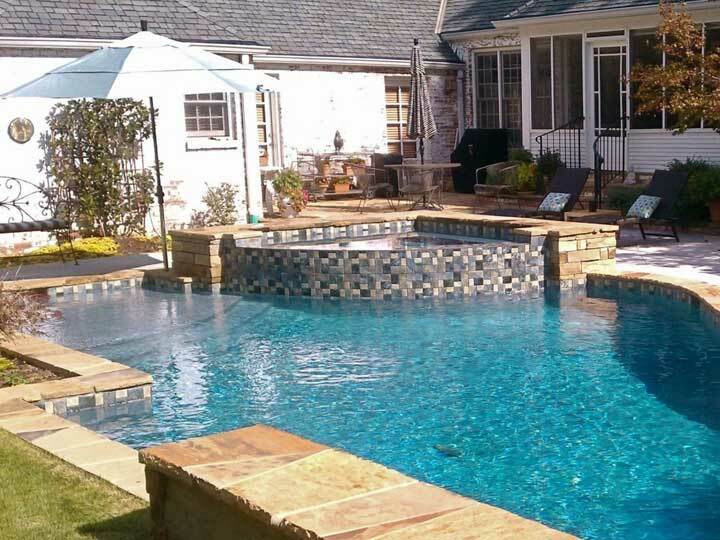 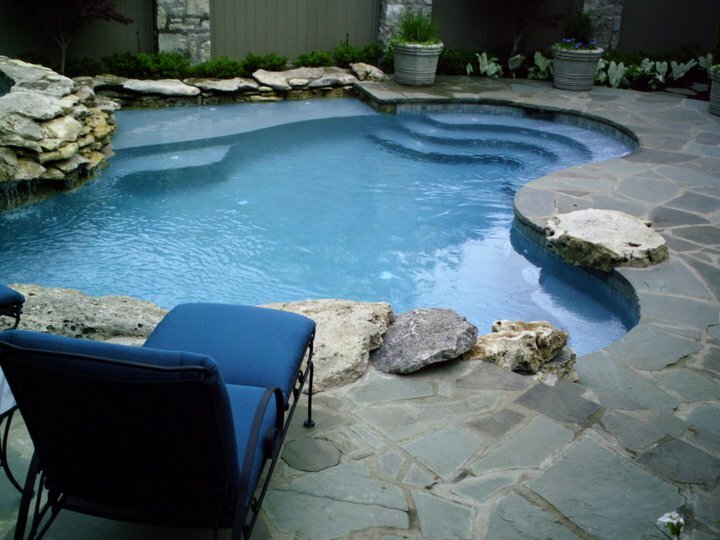 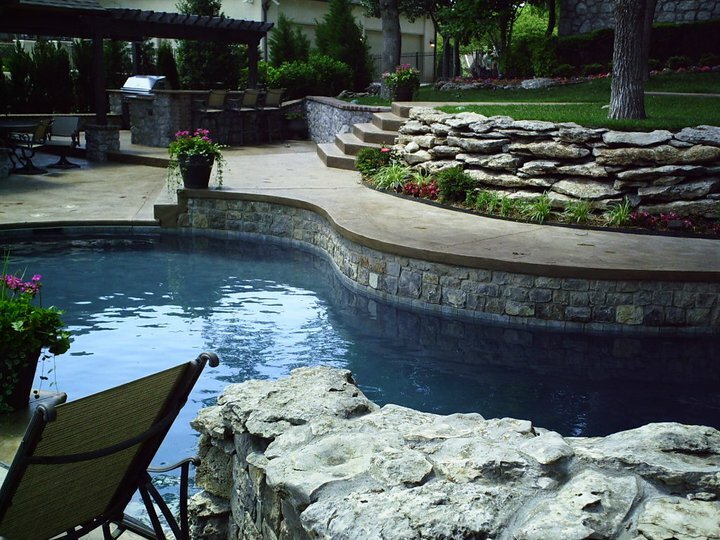 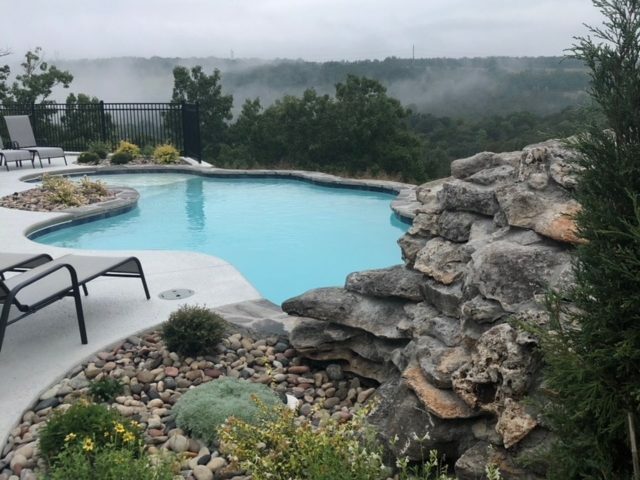 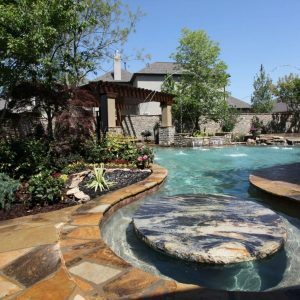 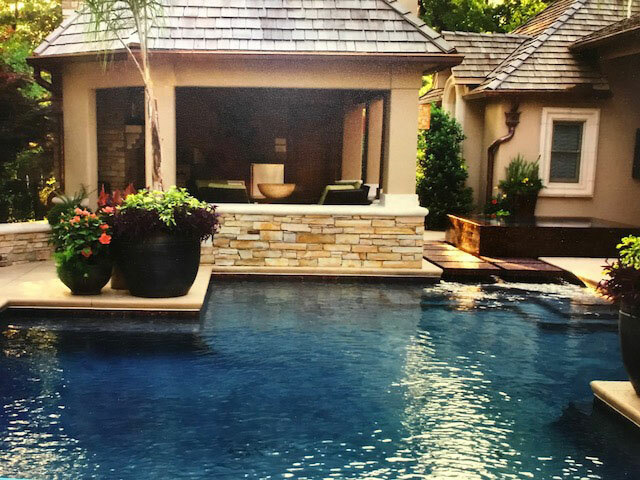 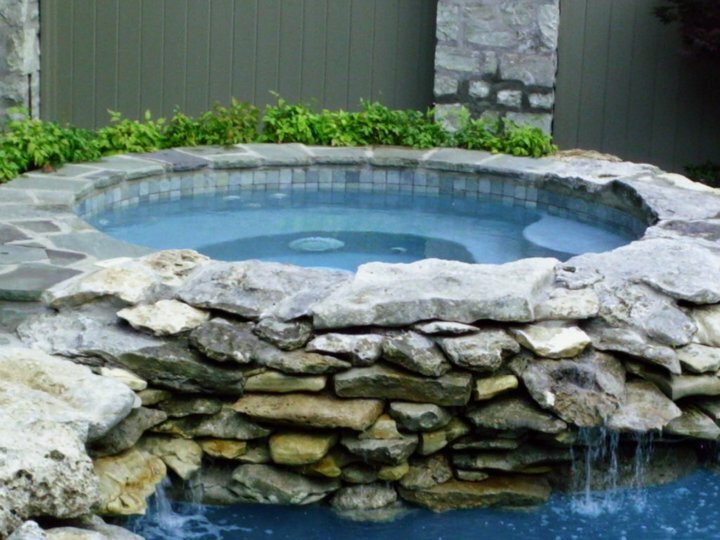 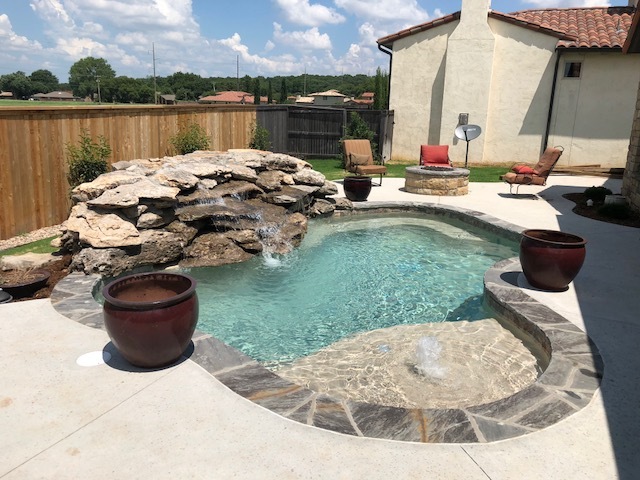 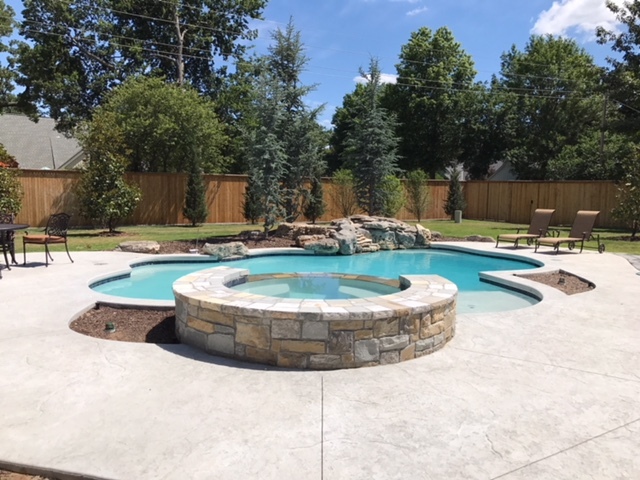 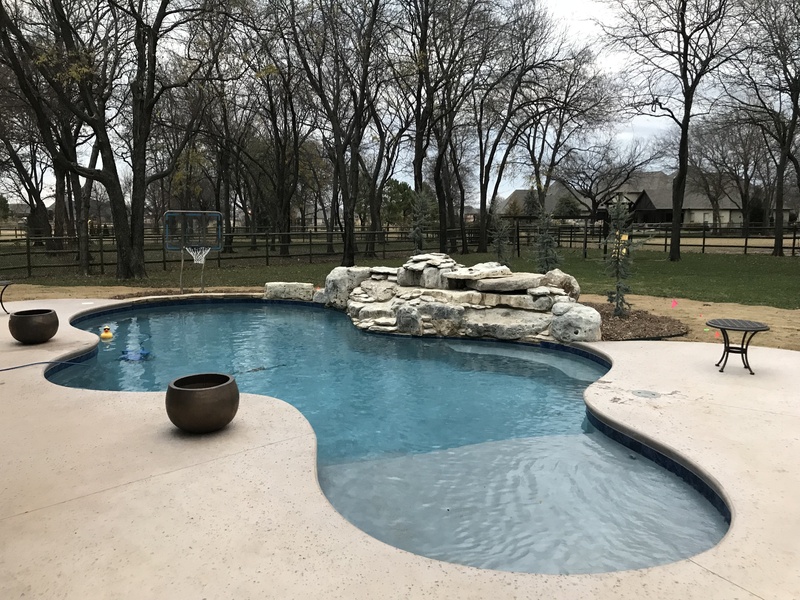 Let us blend your poolscape into its natural setting by creating a natural stone waterfall, slide surround, or other landscaping feature. 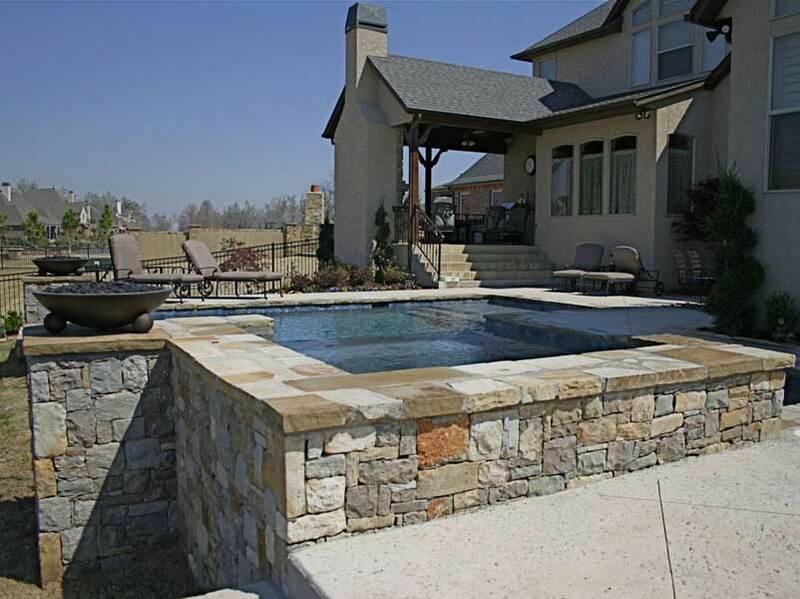 View more Natural Stone Accents on Facebook. 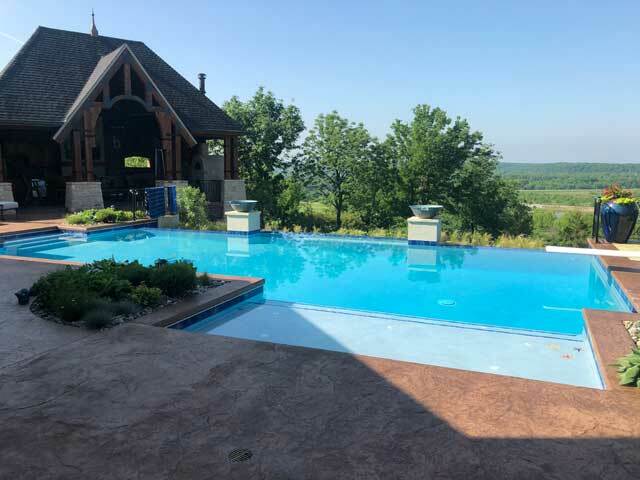 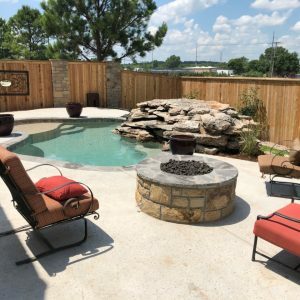 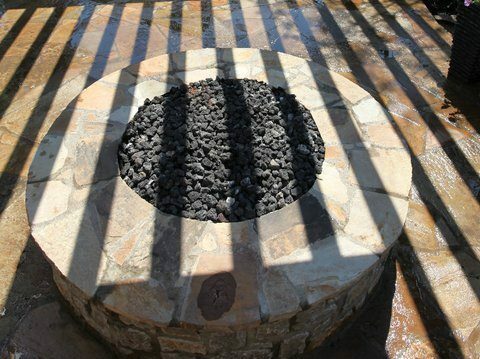 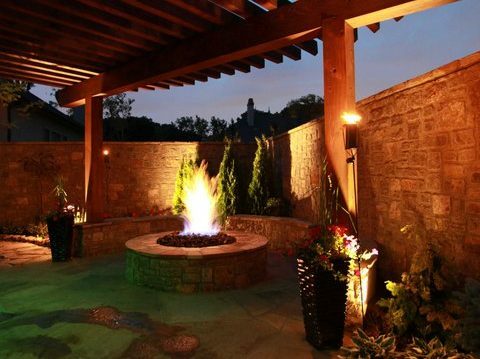 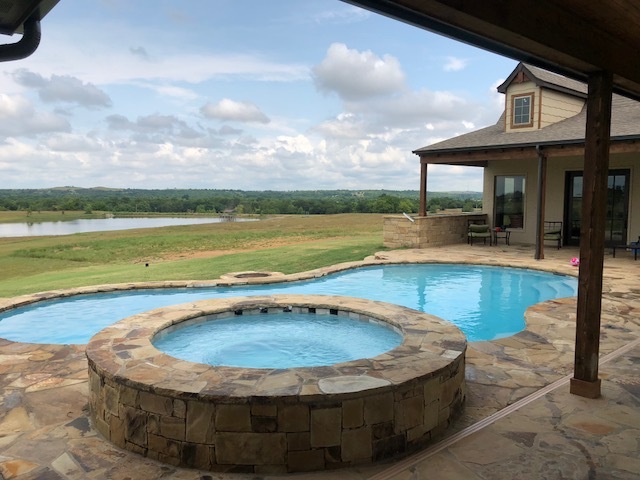 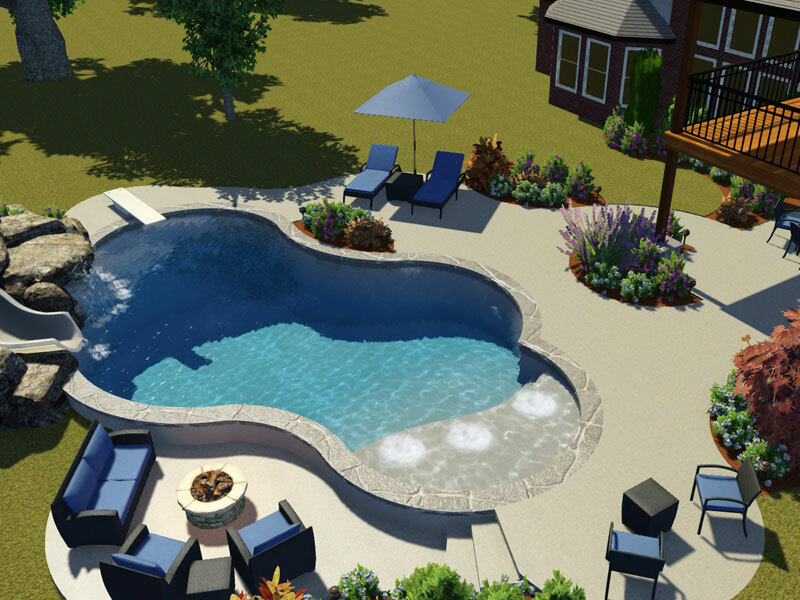 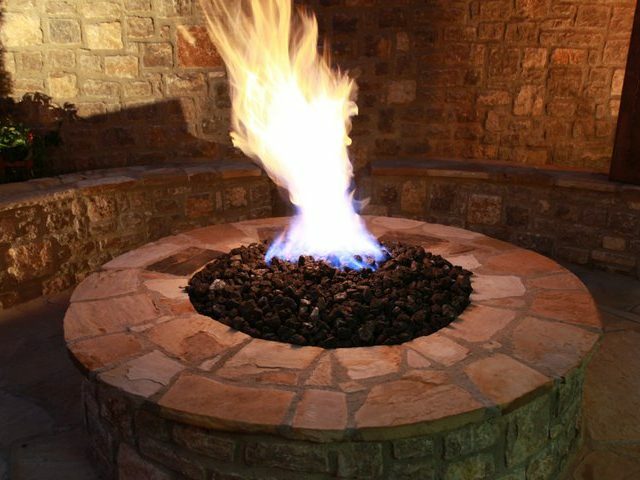 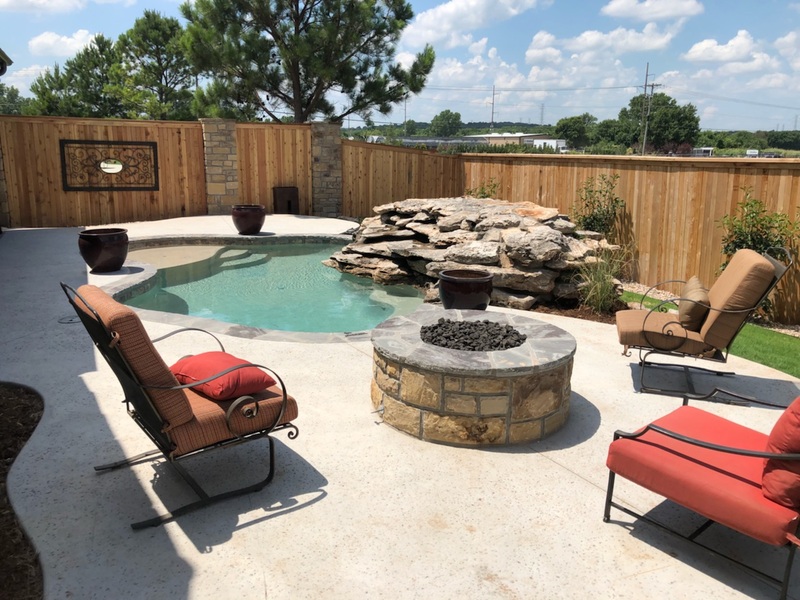 Warm up with a gas or wood-burning firepit, outdoor fireplace, or an elegant set of column-perched fire-bowls at pools edge. 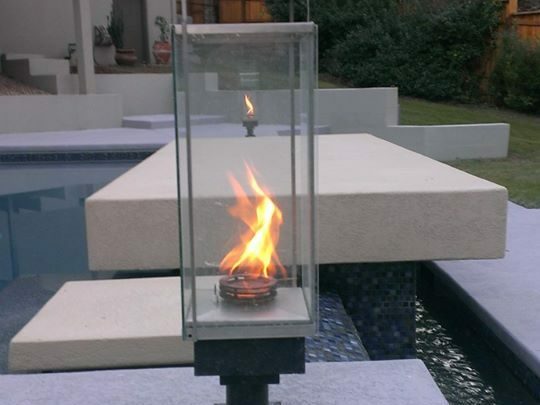 Warm up to more Fire Features on our Facebook here. 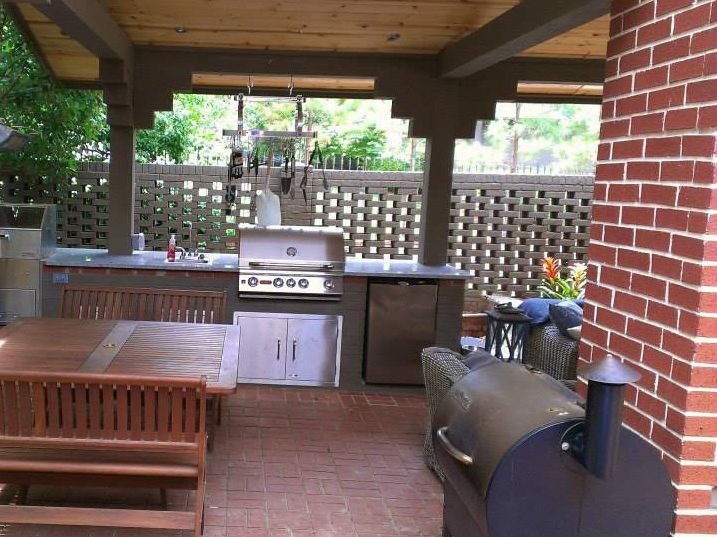 Grill, stove-top, refrigerator, flat screen television, comfortable seating… there’s really no reason to go inside. 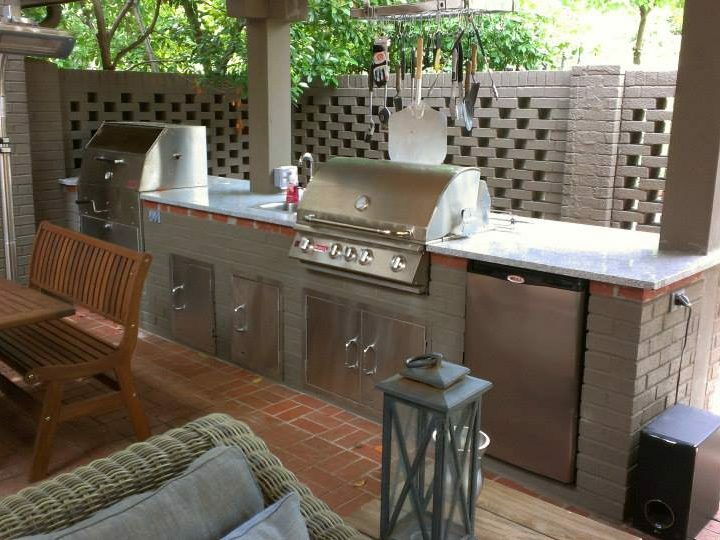 Check out more Outdoor Kitchens here. 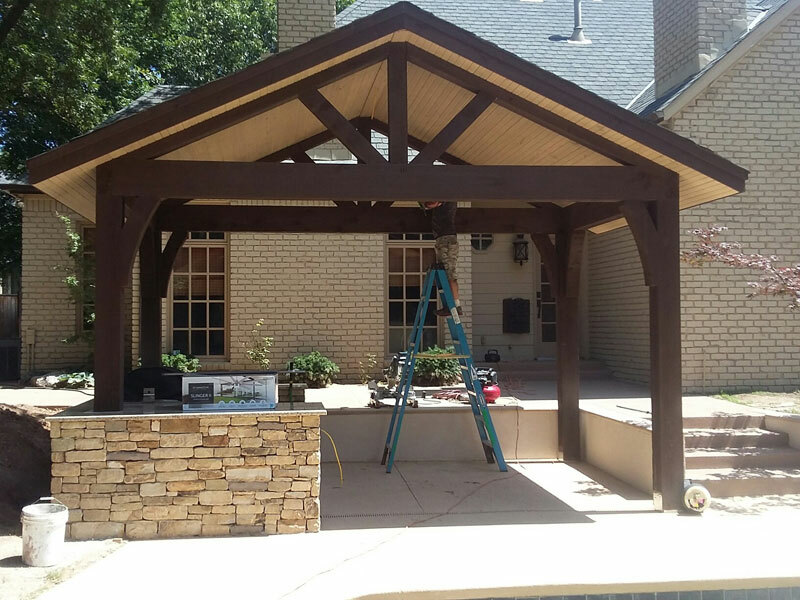 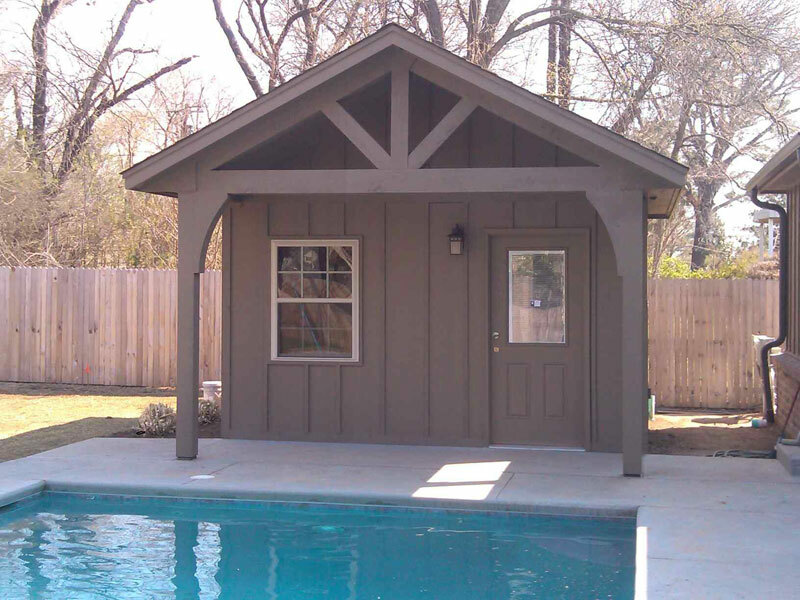 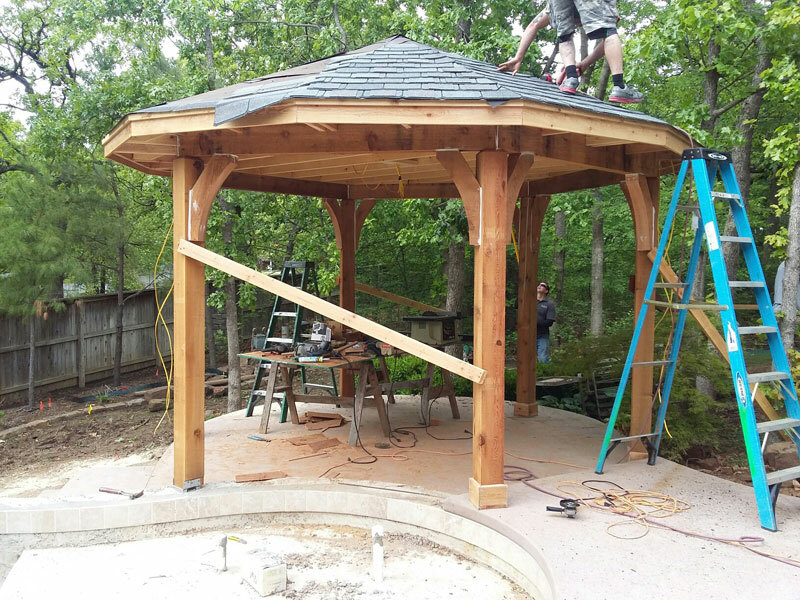 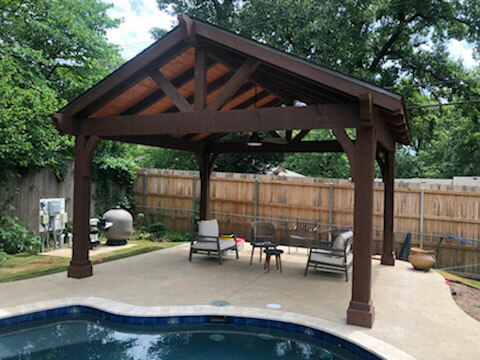 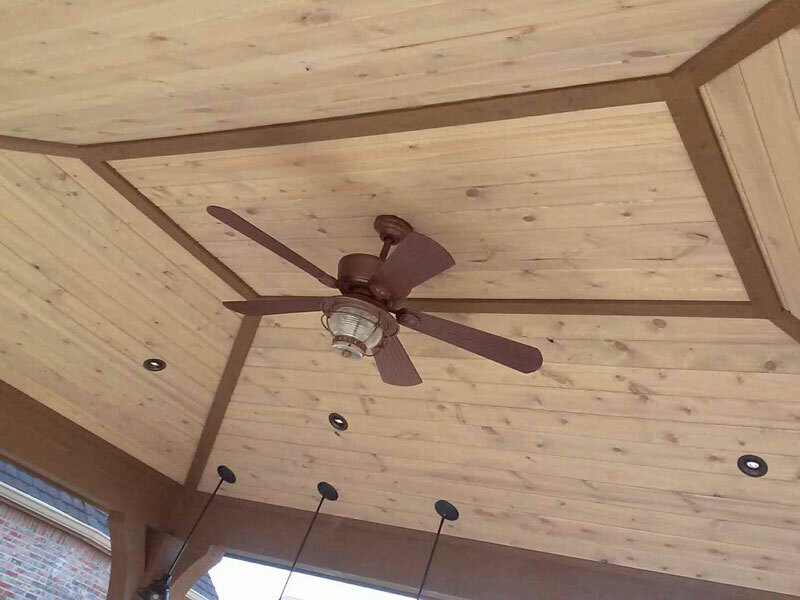 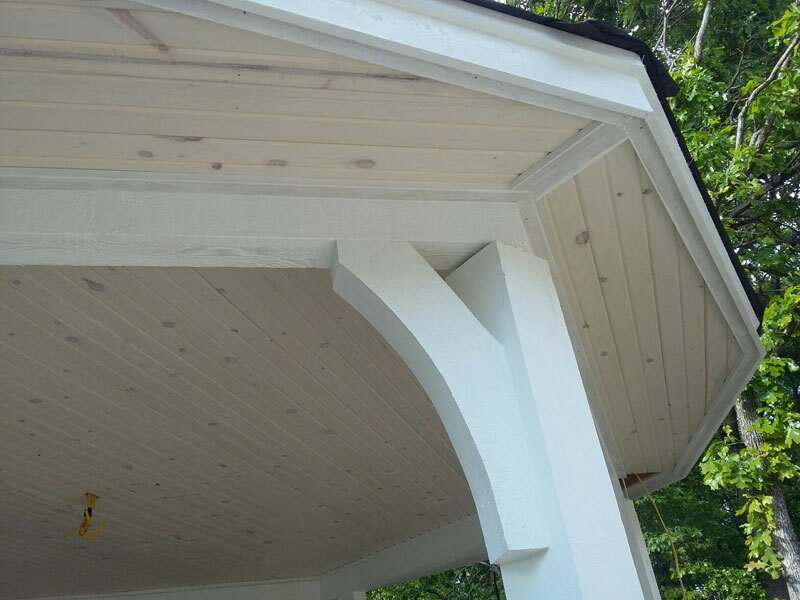 Cabana, gazebo, or pergola – whatever you have in mind, we can bring it to life. 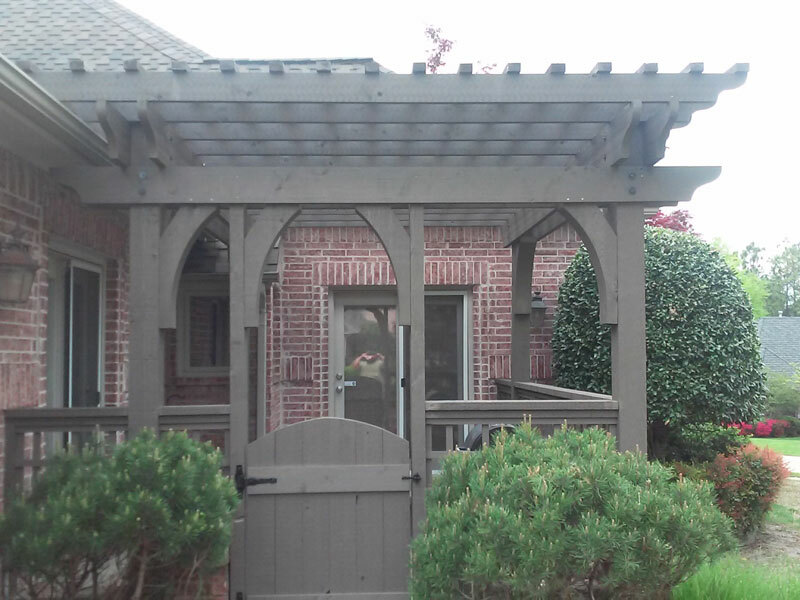 See more Overhead Structures/Pergolas on Facebook. 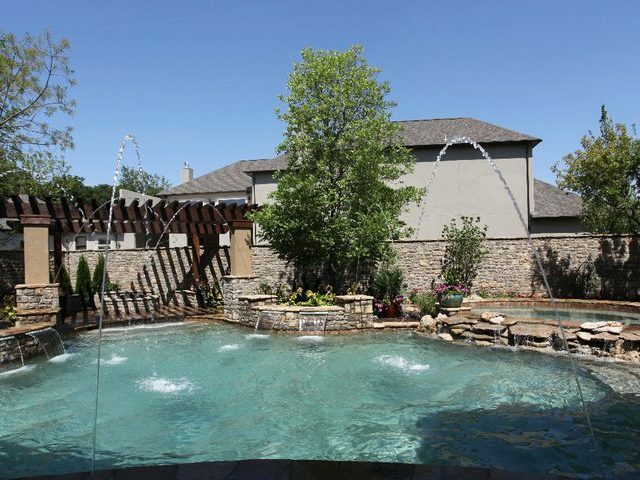 Don’t tell the neighborhood – but you can have a personalized water-park in your back yard. 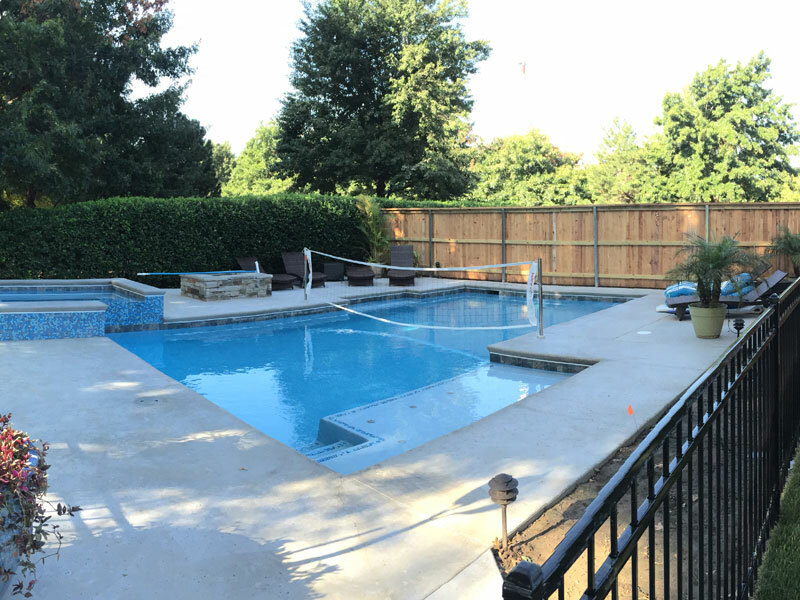 Volleyball, anyone? 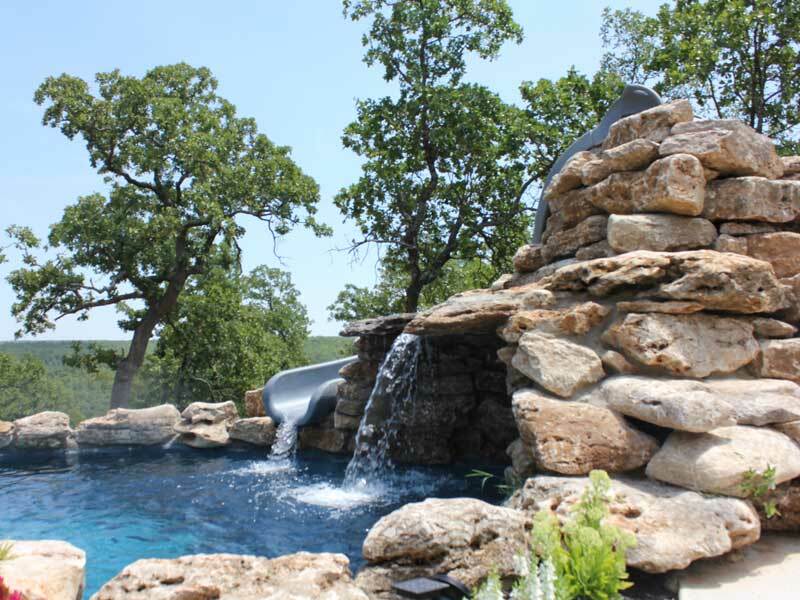 Explore more Slides, Dives, and Watersports features here. 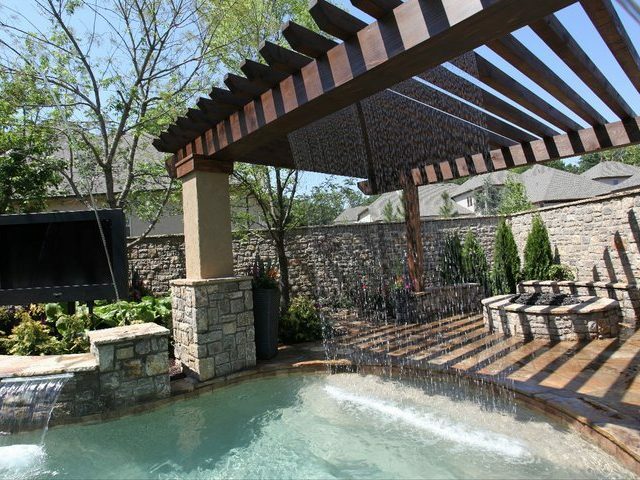 Find more of your favorite Spa Stylings on our Facebook. 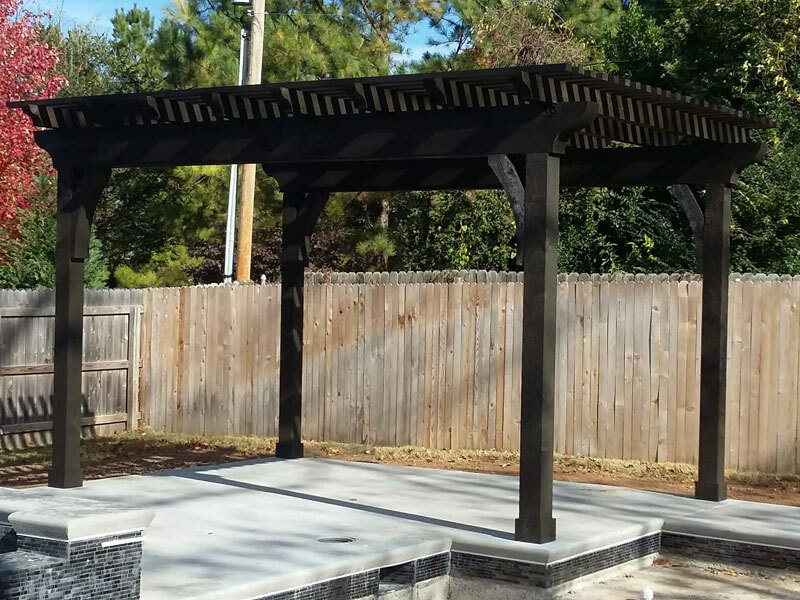 Our pros can work with you to decide which type of cover is best for you. 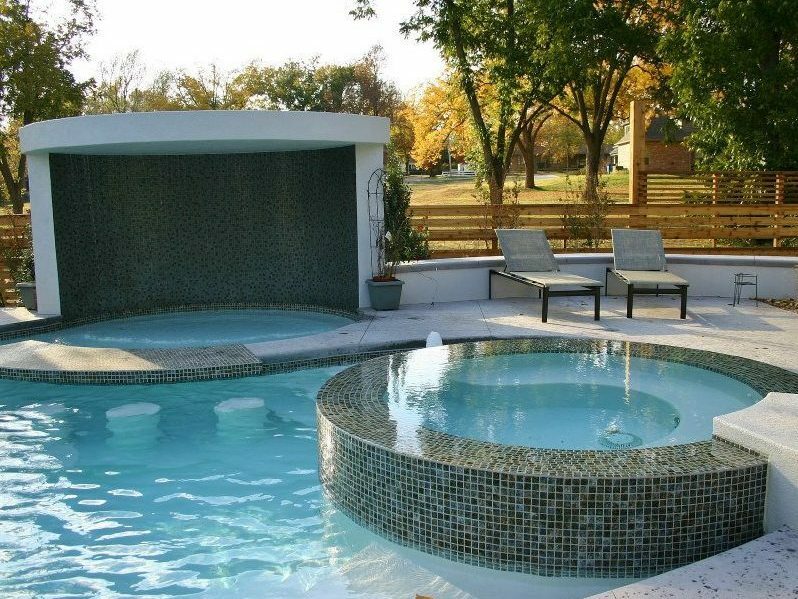 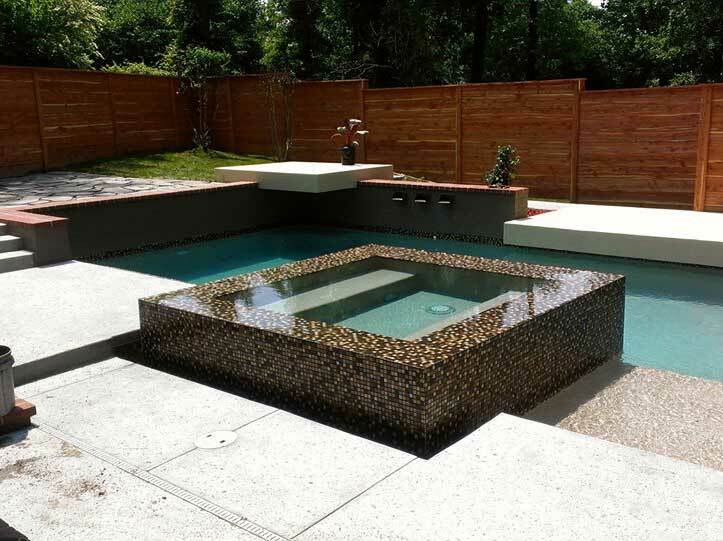 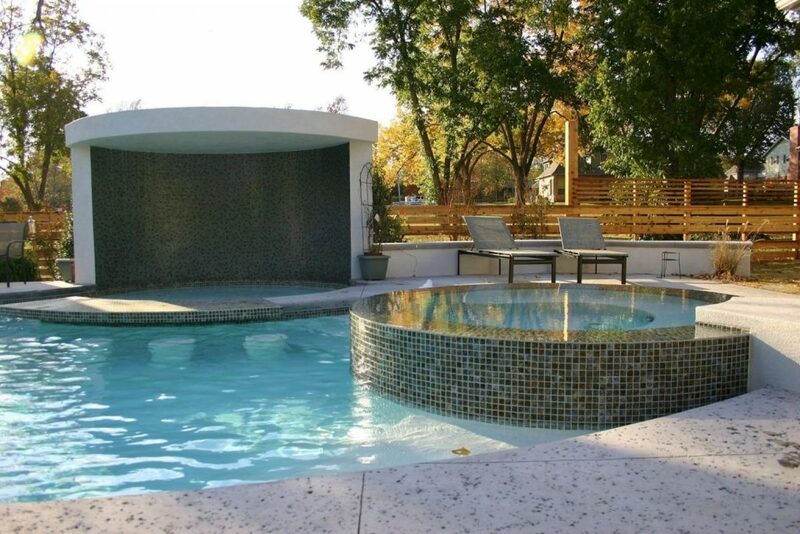 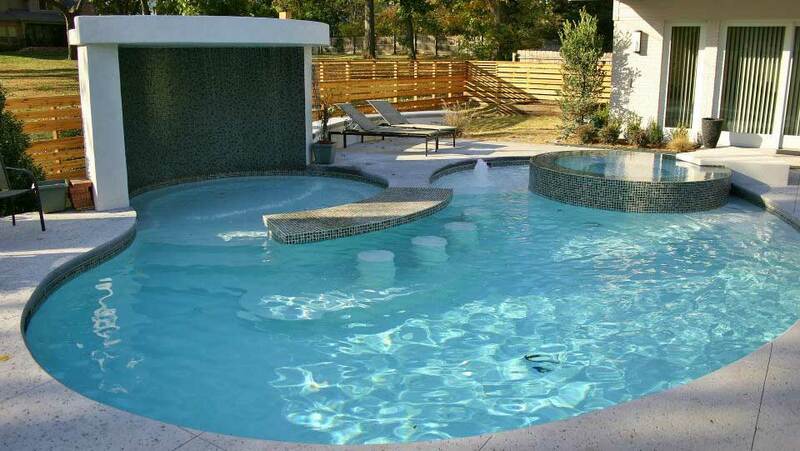 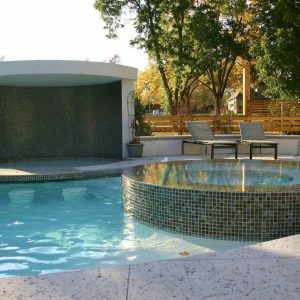 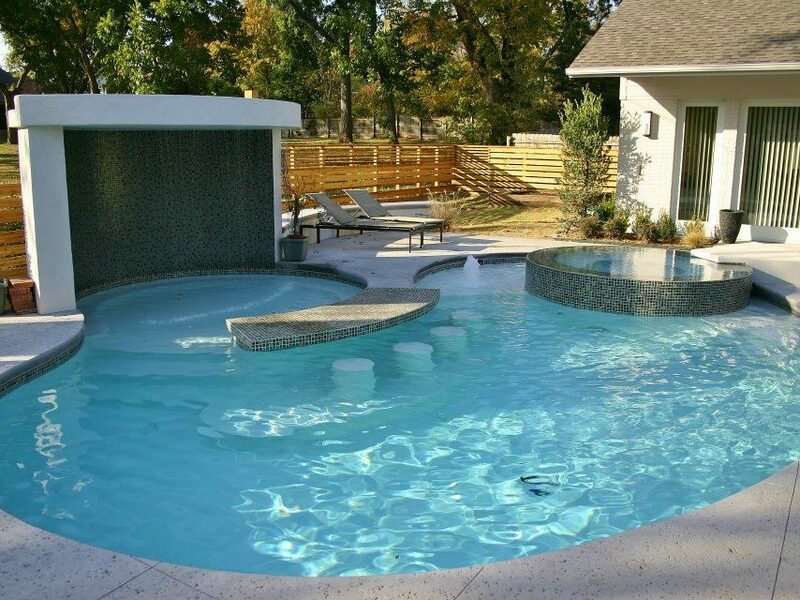 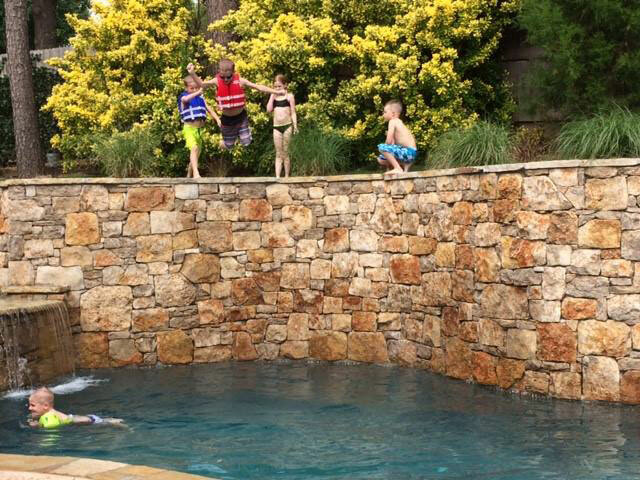 We will custom fit and install a mesh, solid, or automated cover to suit your unique Vivion Pool.